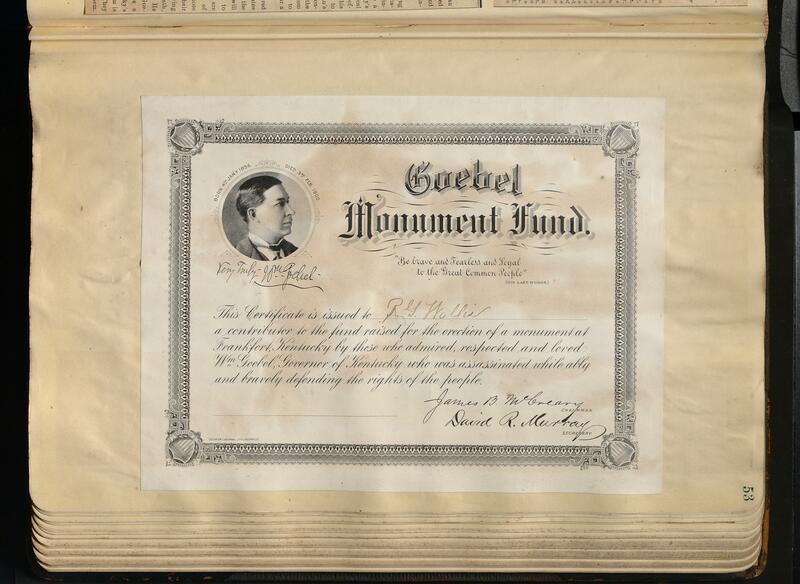 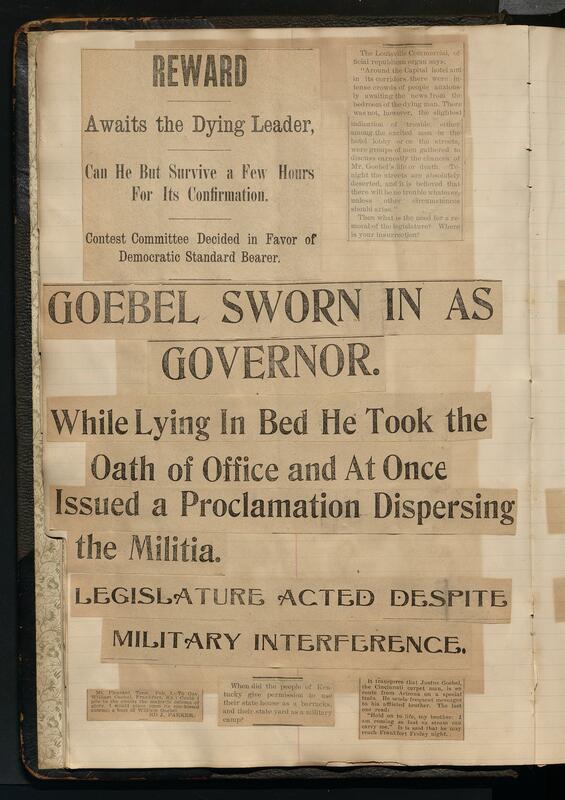 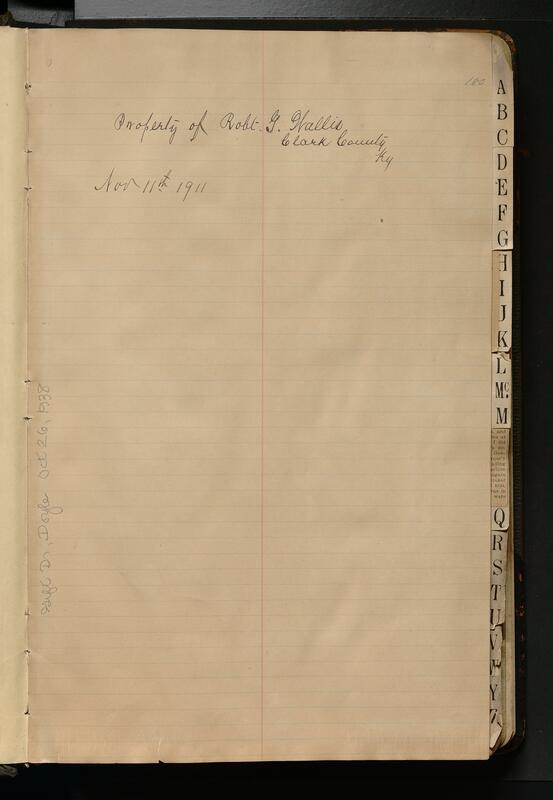 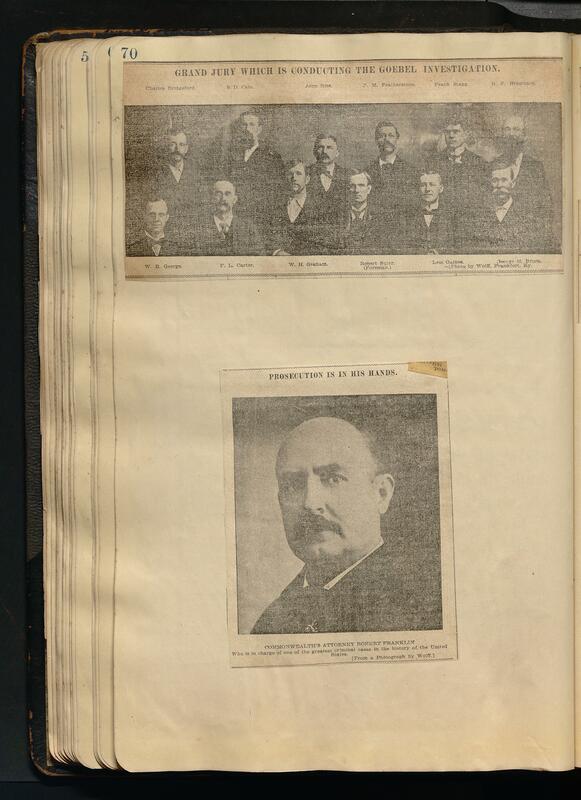 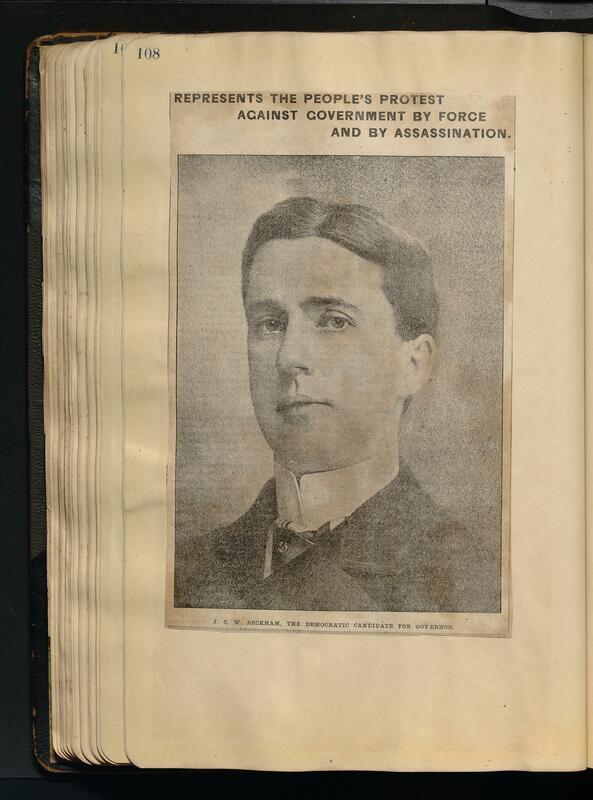 The Robert G. Wallis scrapbook (dated 1900-1911; 0.24 cubic feet; 1 item) consists of a scrapbook entitled Our Martyred Governor, William Goebel. 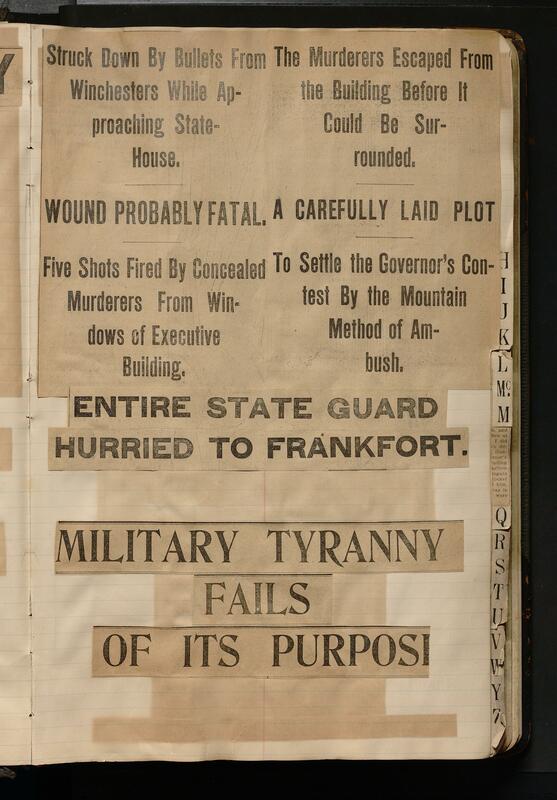 Assassination -- Politics and government -- Kentucky. 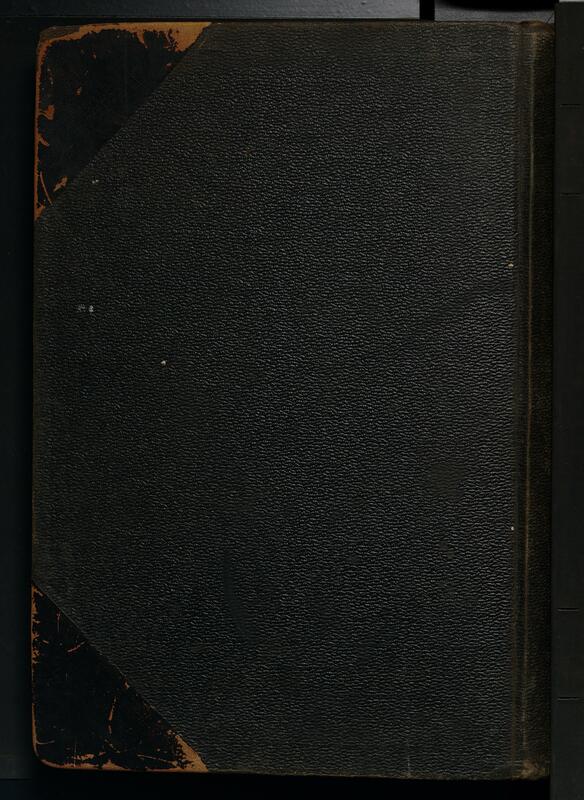 46m7: [identification of item], Robert G. Wallis scrapbook, 1900-1911, University of Kentucky Special Collections Research Center. 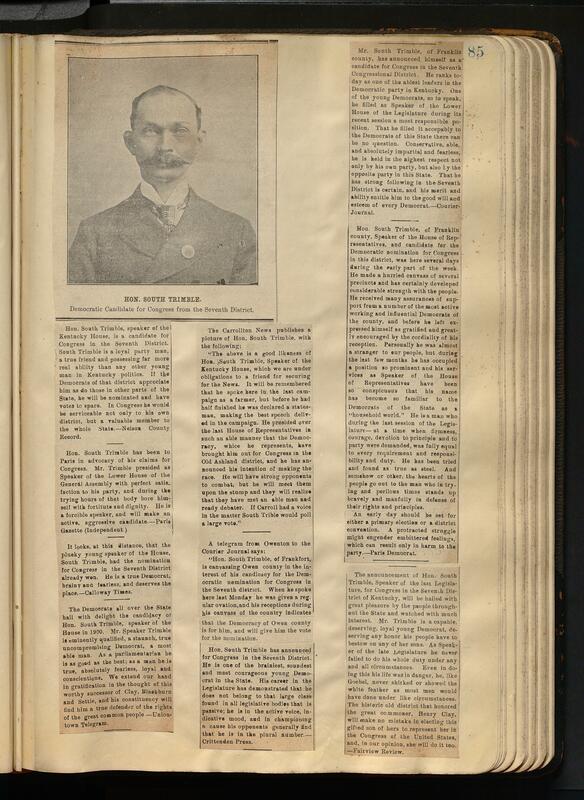 Farmer Robert G. Wallis was born on September 25, 1859, in Fayette, Kentucky, the son of Thomas Morgan Wallis (1804-1918) and Susan Thomas Dudley (1826-1901). 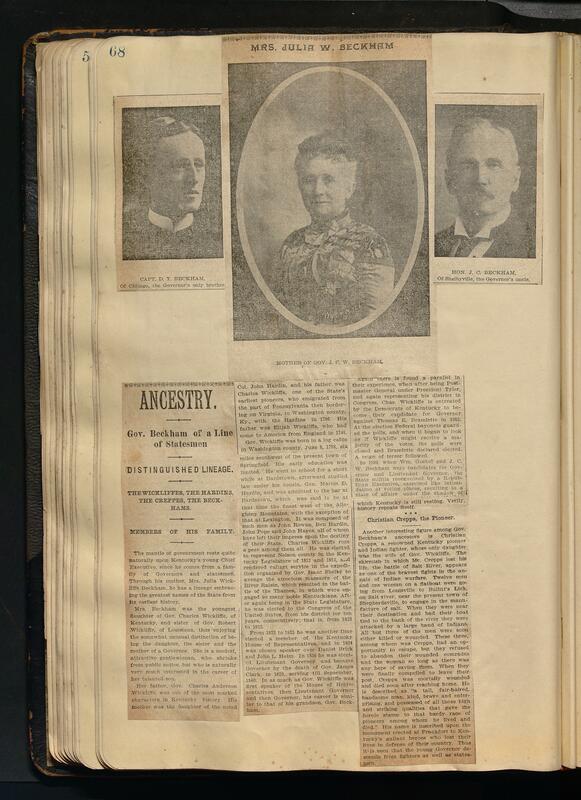 In 1901, he married Ollie Ranger Fishback (1866-1943); they had no children. 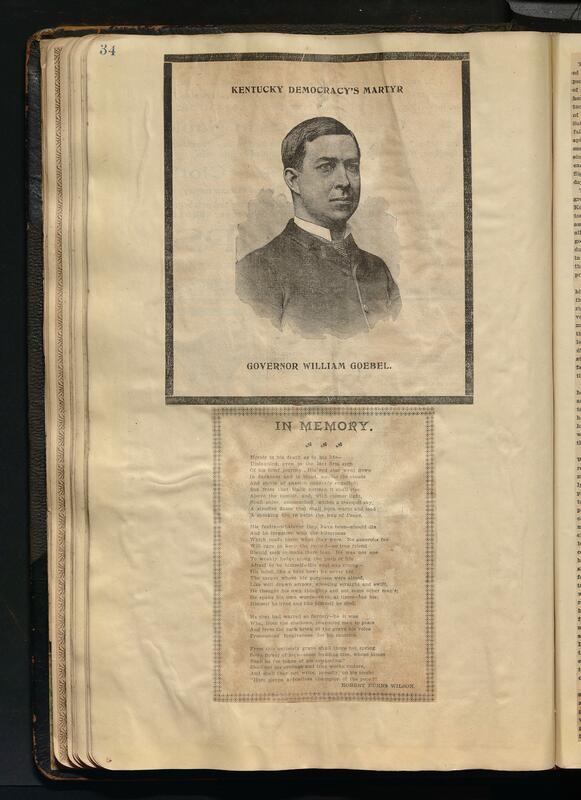 Wallis died on January 31, 1920 in Clark, Ky. 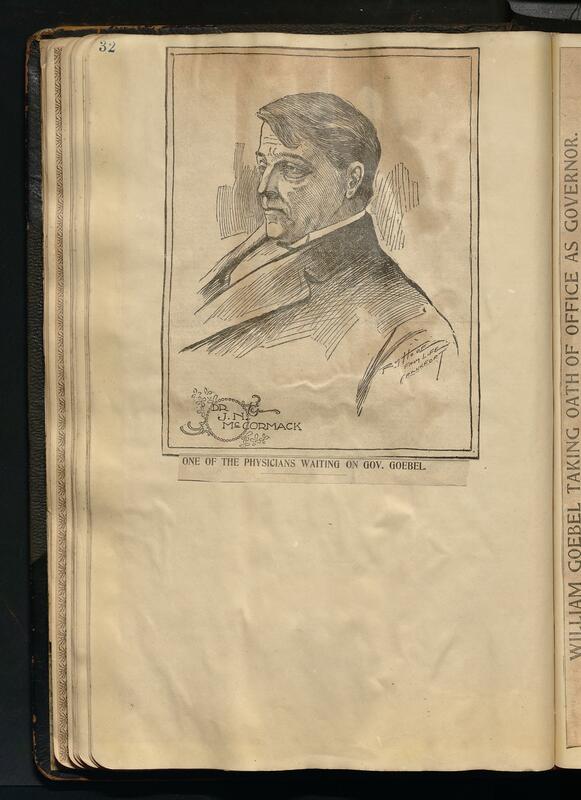 Senator and Governor William Goebel was born on January 4, 1856, in Pennsylvania, to Wilhelm Goebel (1830-1877) and Augusta Justus (1831-?). 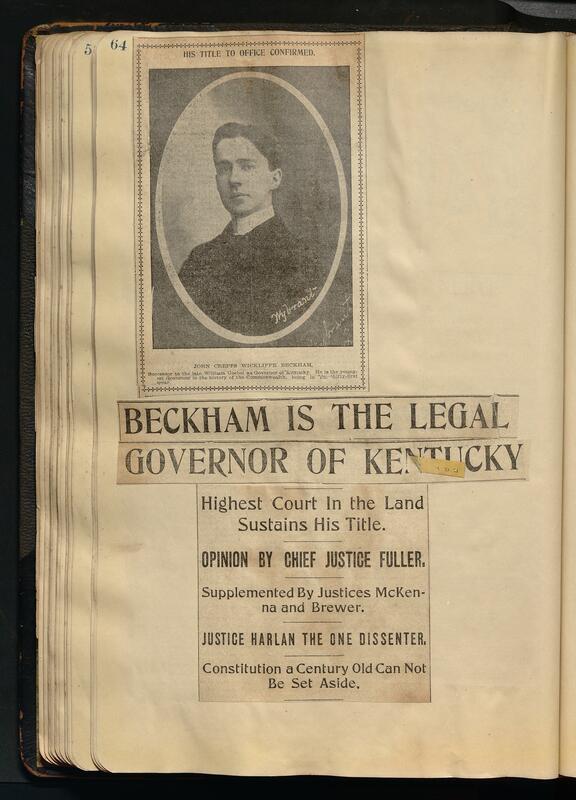 He received a degree from Cincinnati Law School in 1877 and served in the Kentucky State Senate from 1887-1899. 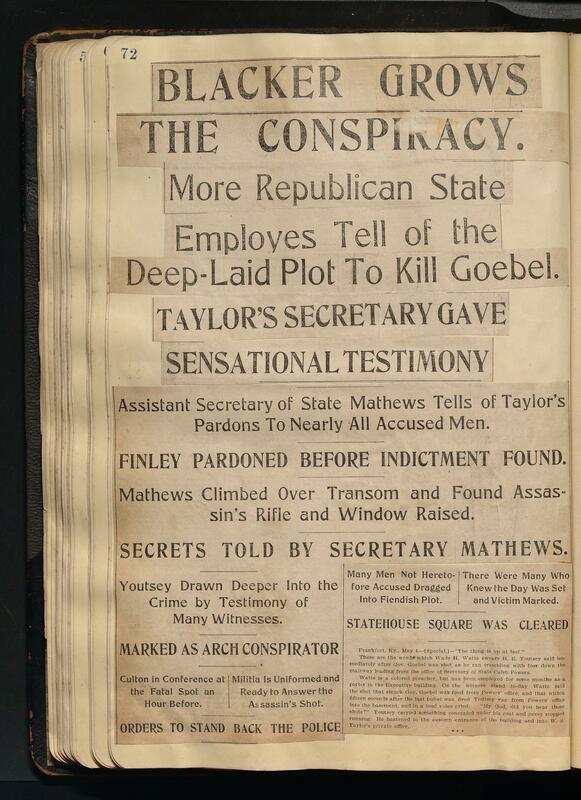 Goebel was shot on January 30, 1900, following an election appeal where he was voted governor of Kentucky. 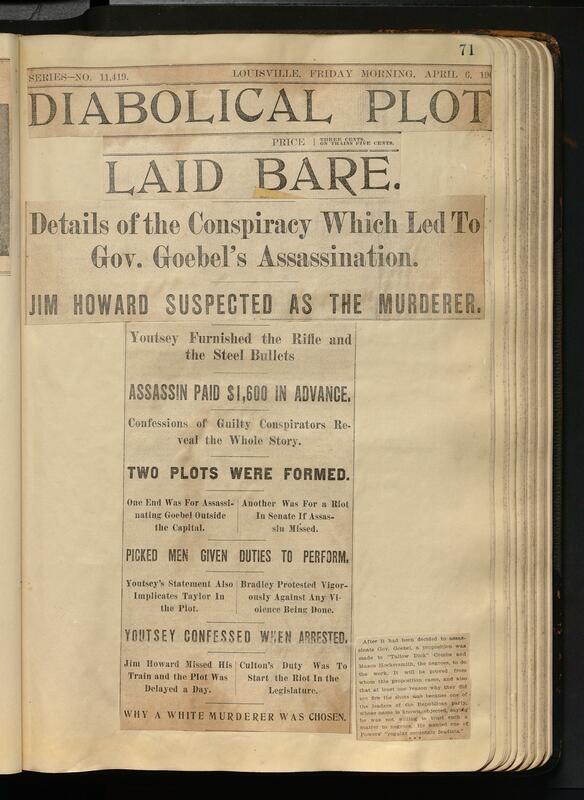 The only United States governor to be assassinated, Goebel died from his wounds on February 3, 1900. 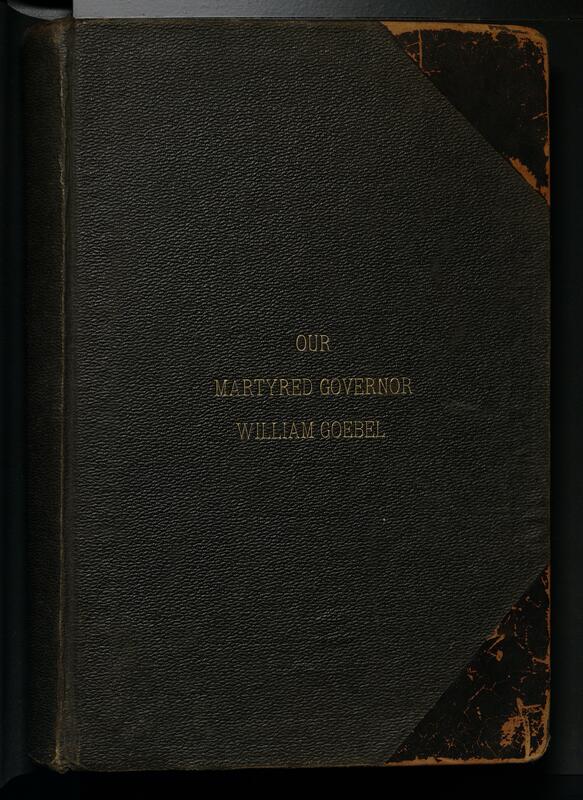 The Robert G. Wallis scrapbook (dated 1900-1911; 0.24 cubic feet; 1 item) consists of a scrapbook entitled Our Martyred Governor, William Goebel. 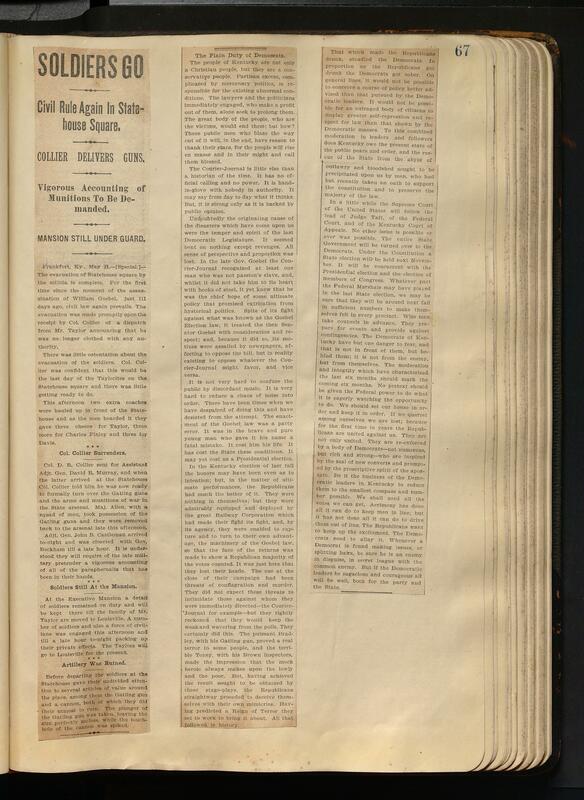 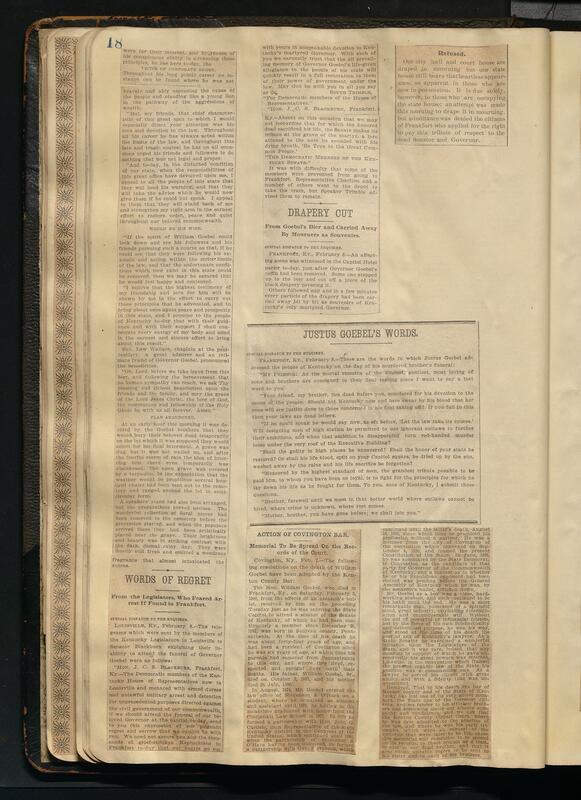 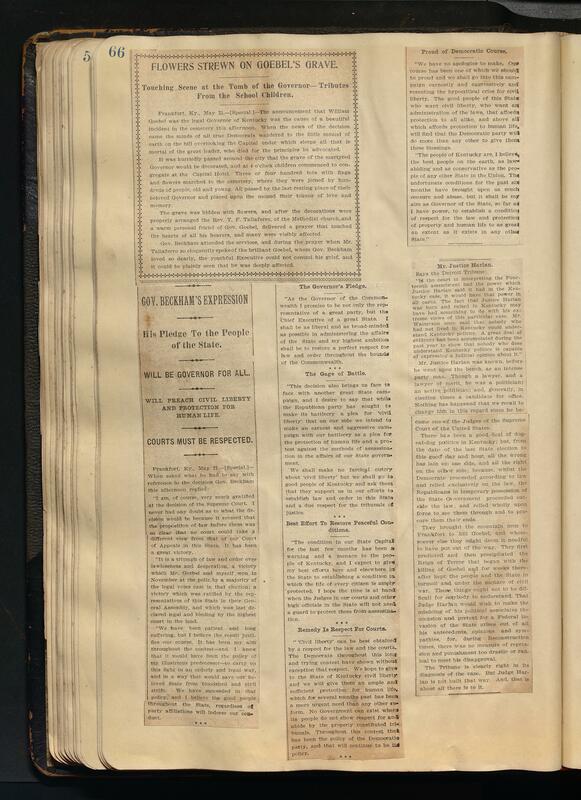 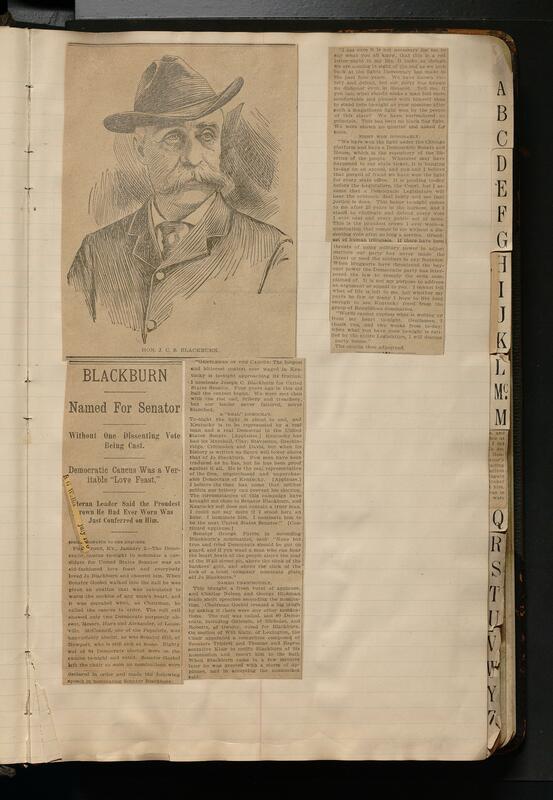 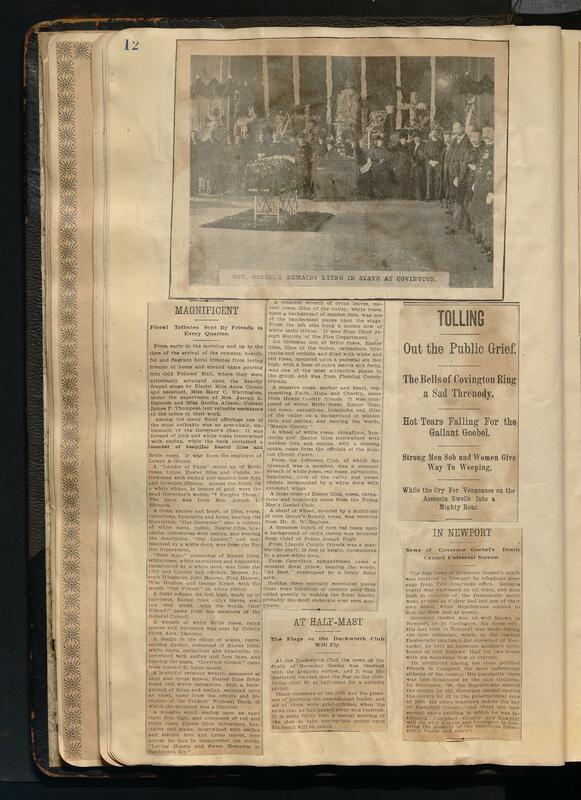 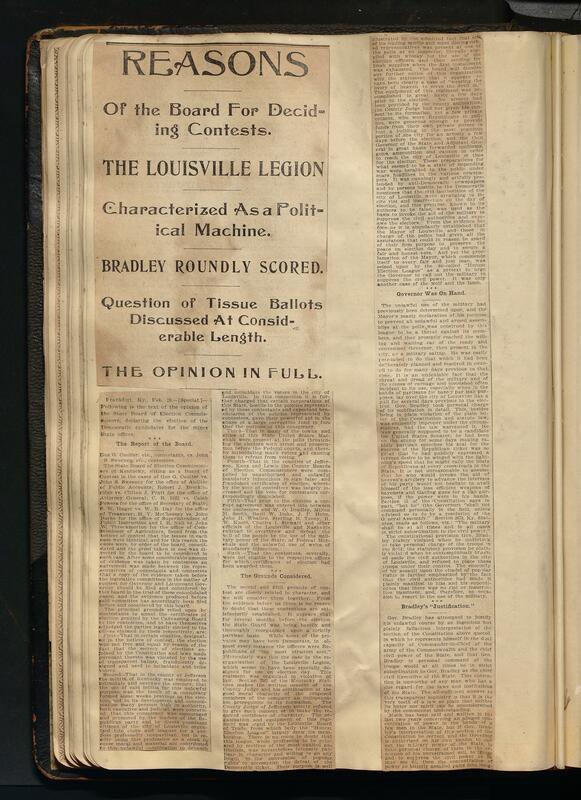 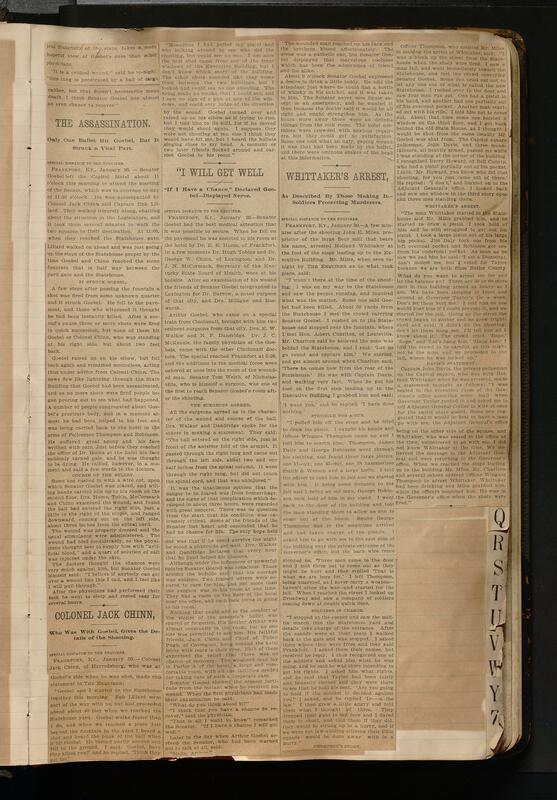 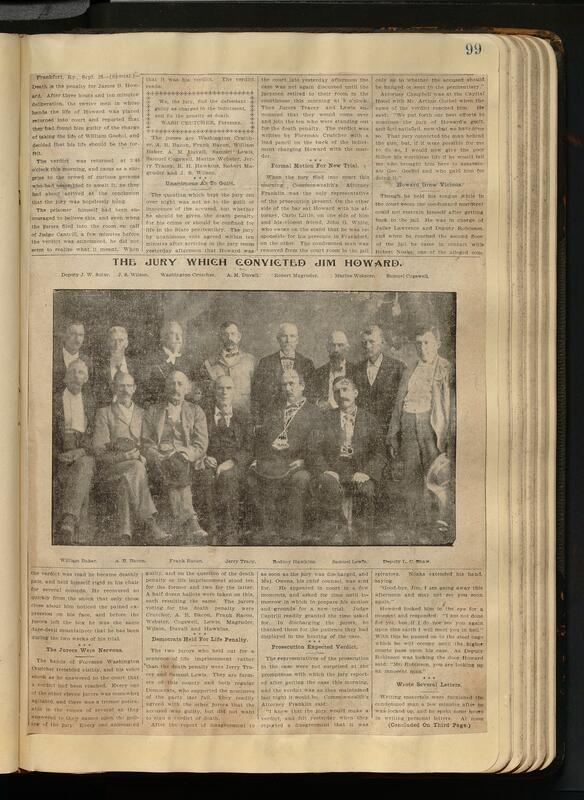 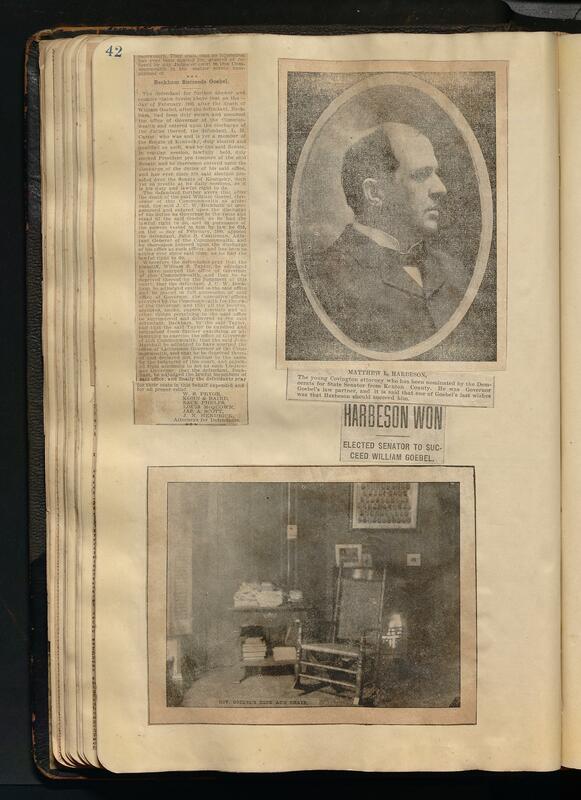 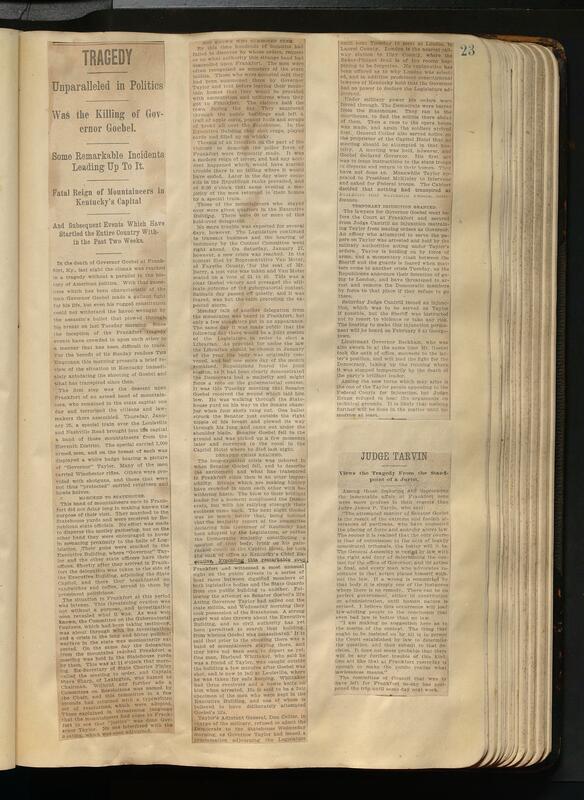 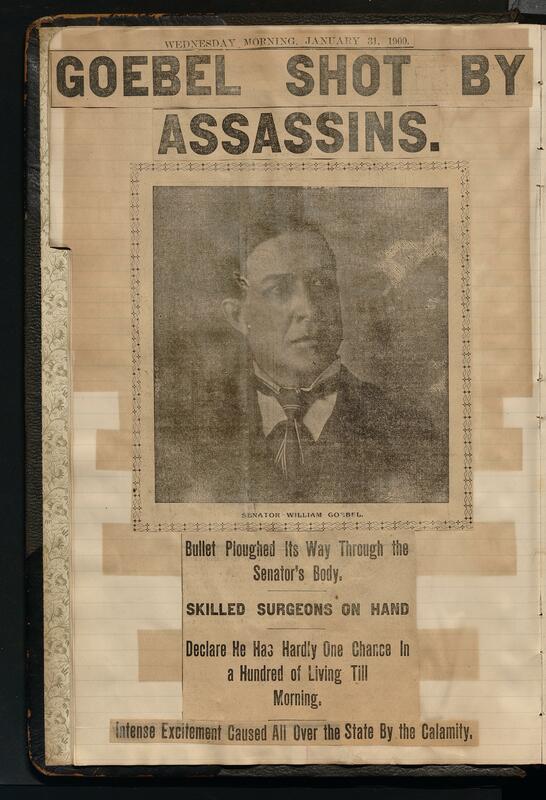 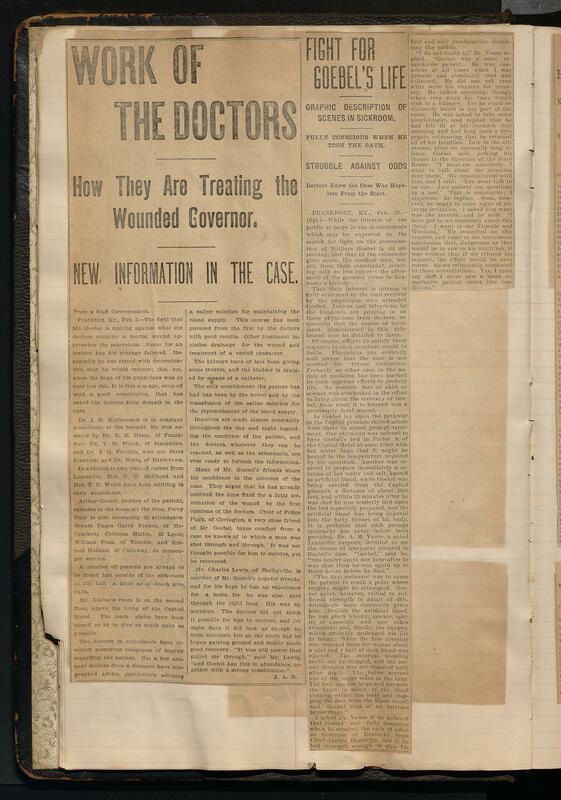 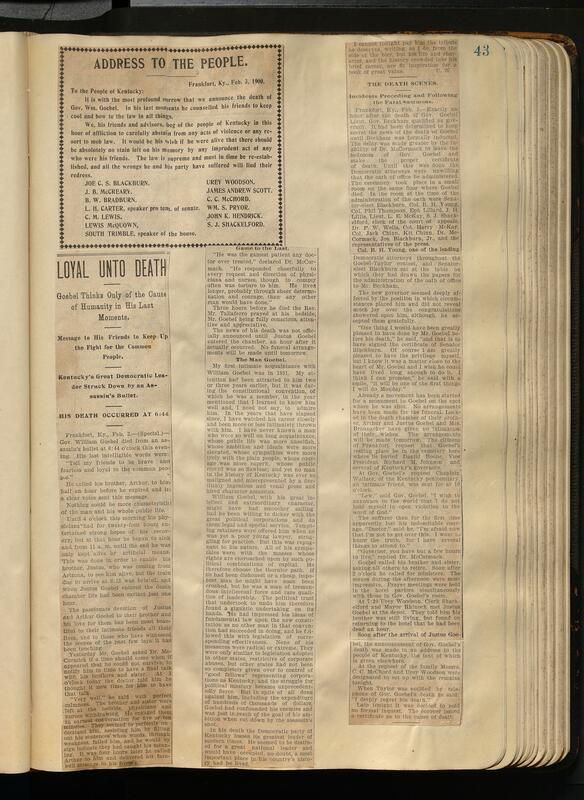 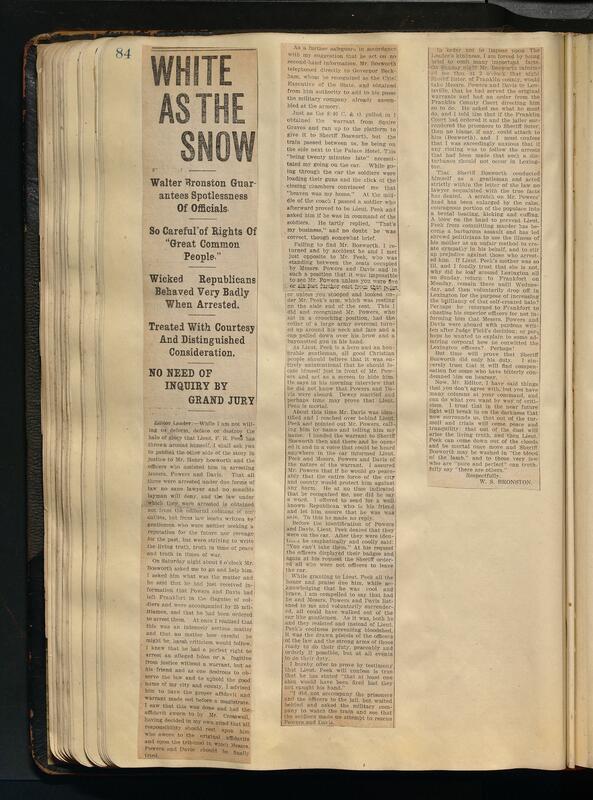 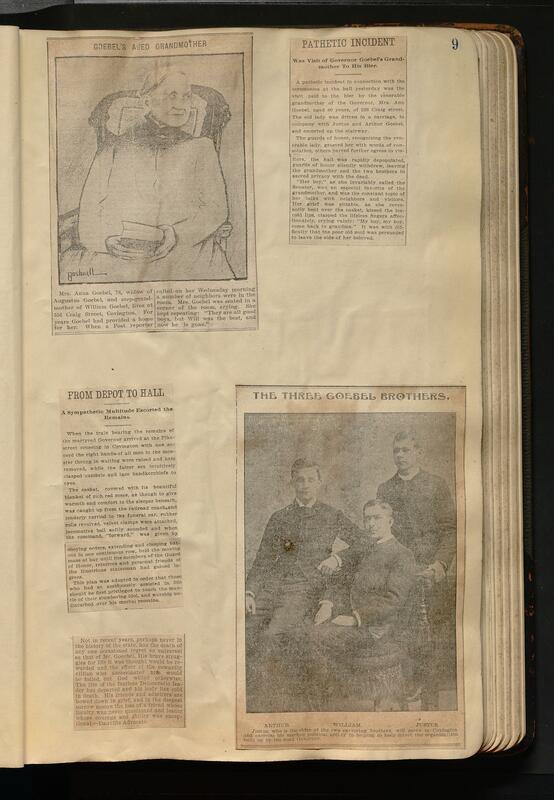 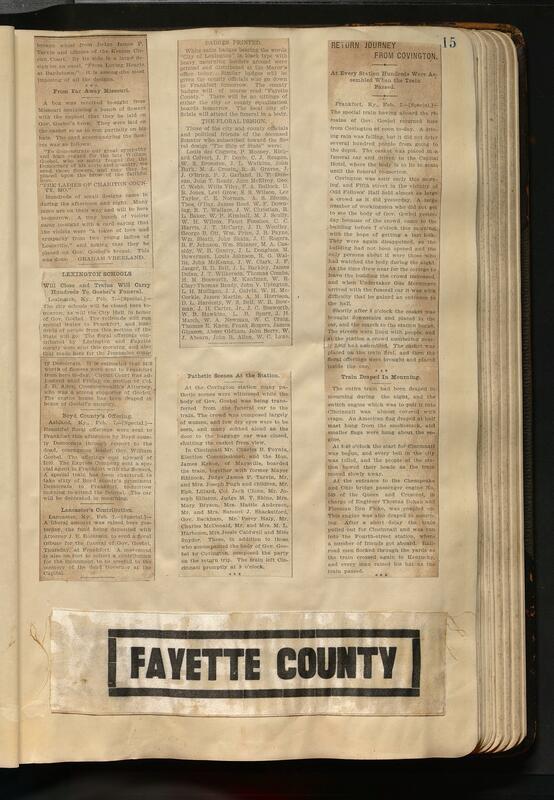 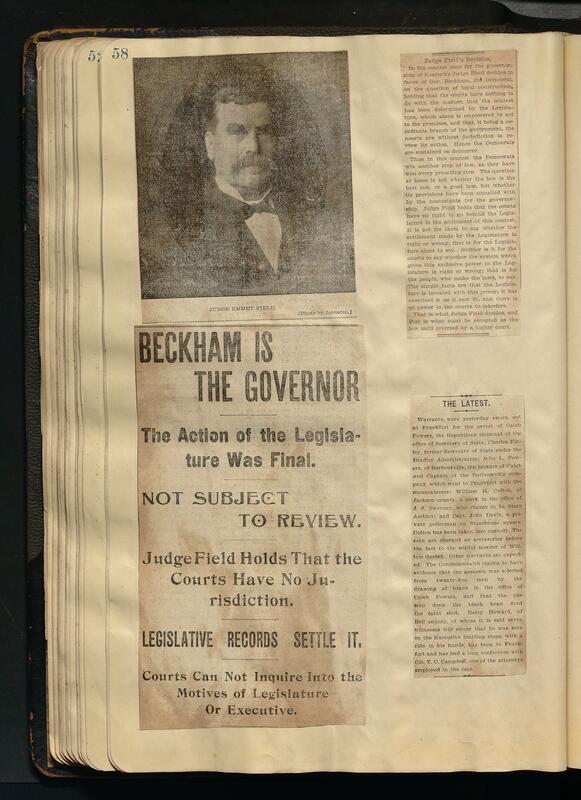 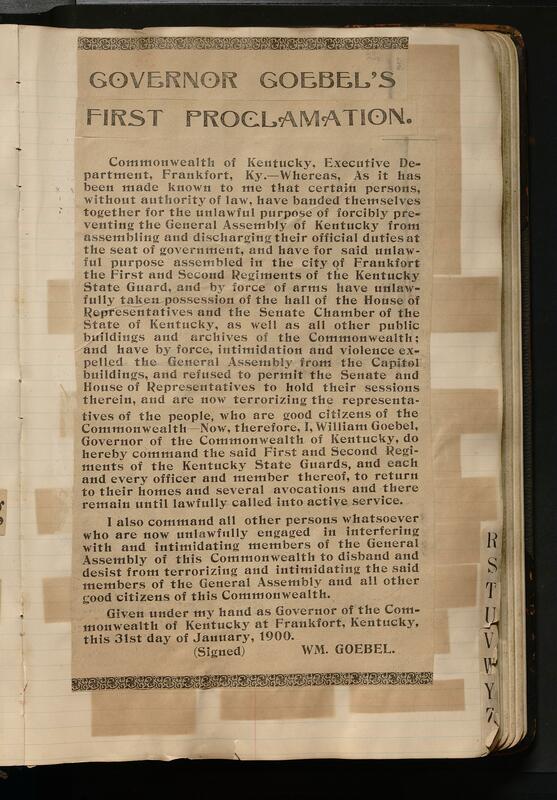 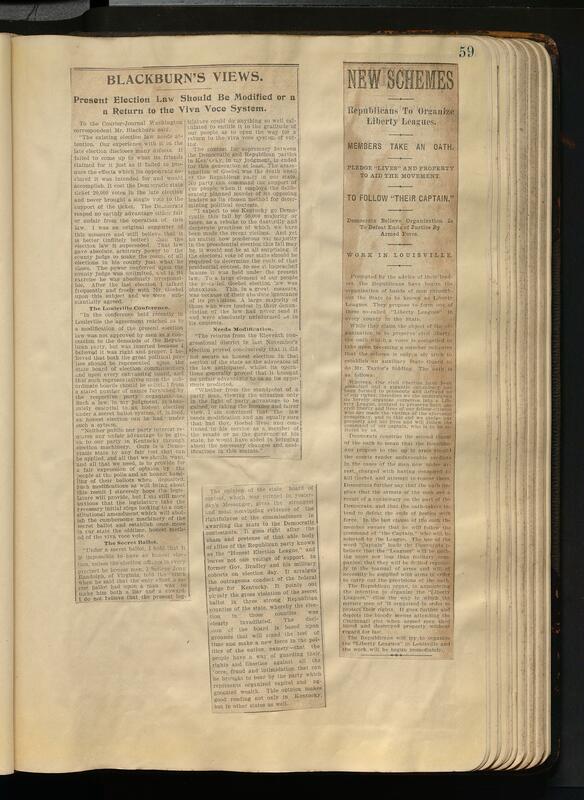 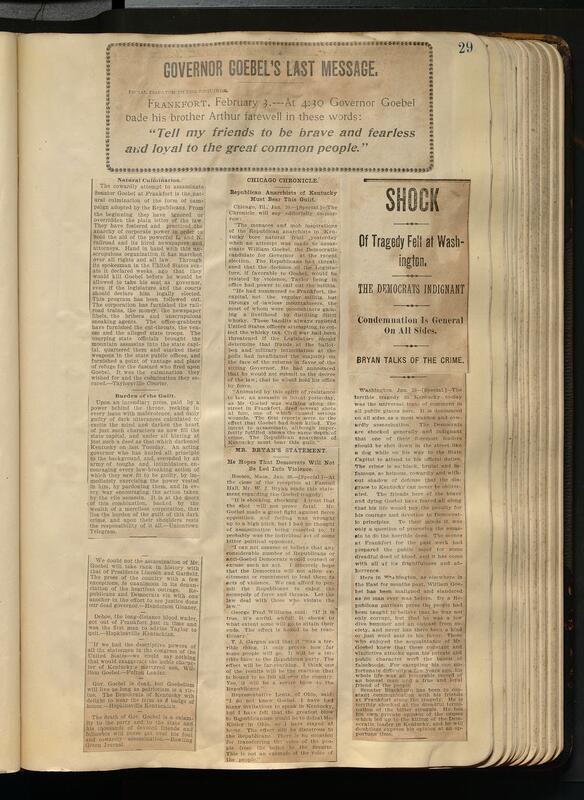 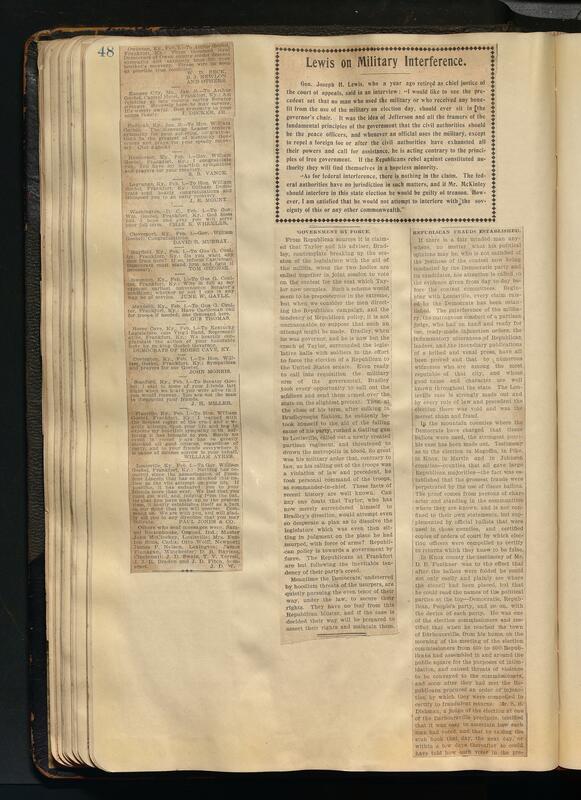 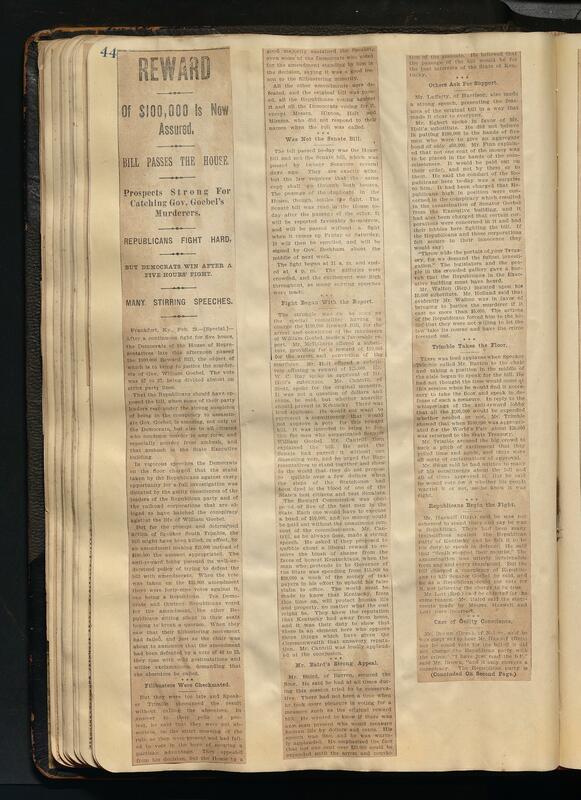 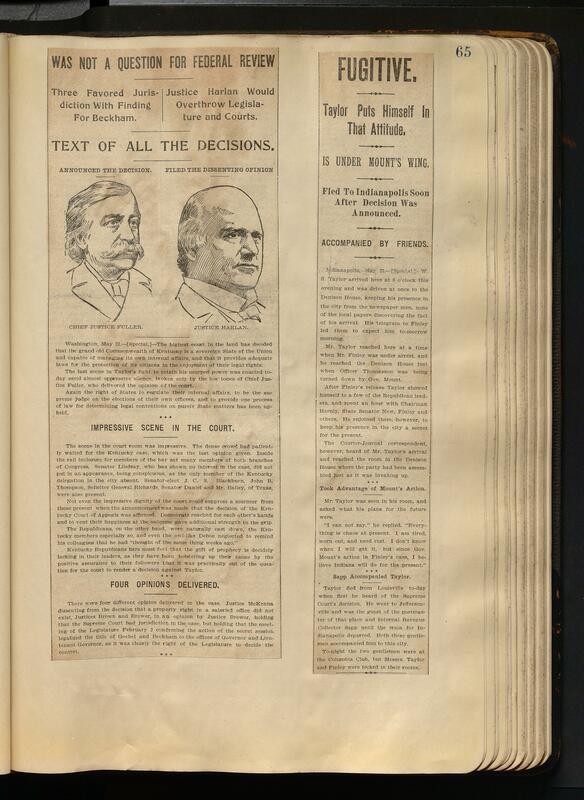 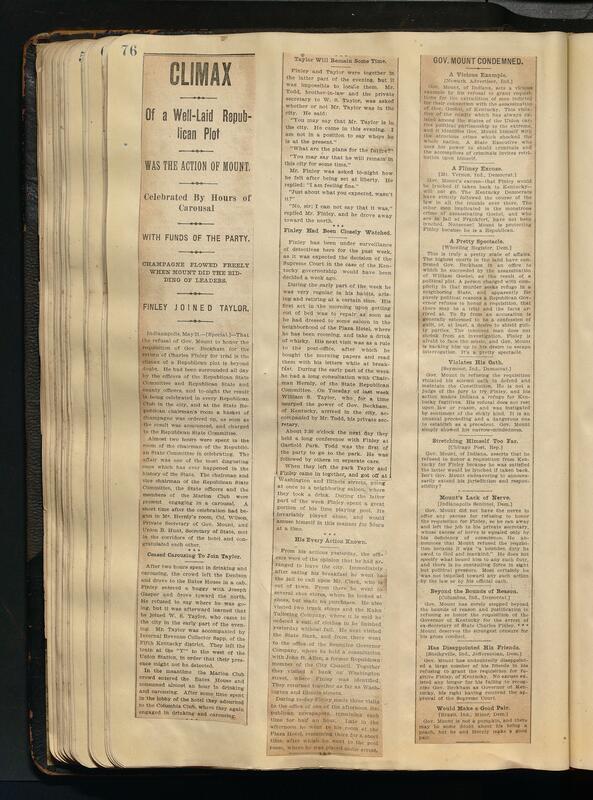 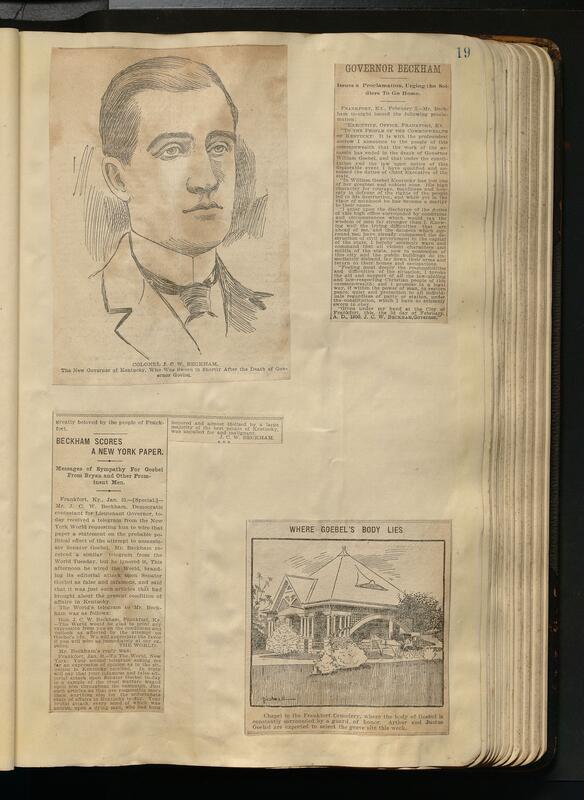 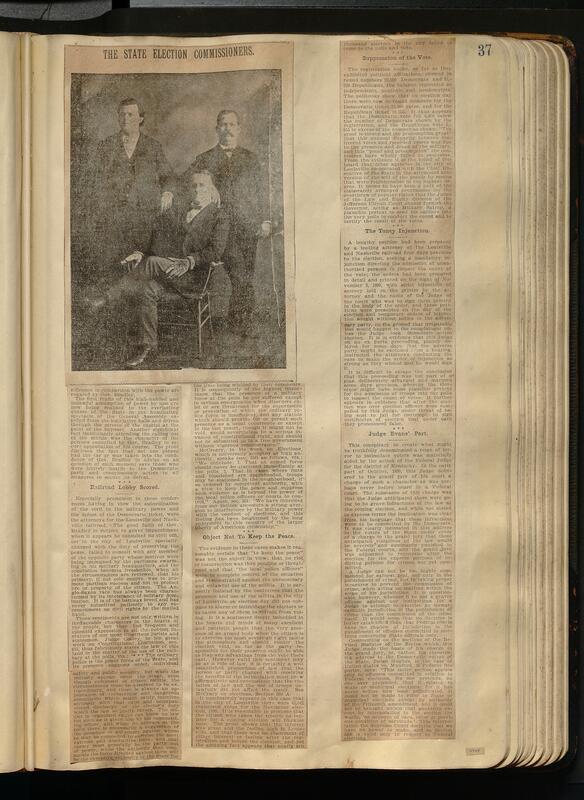 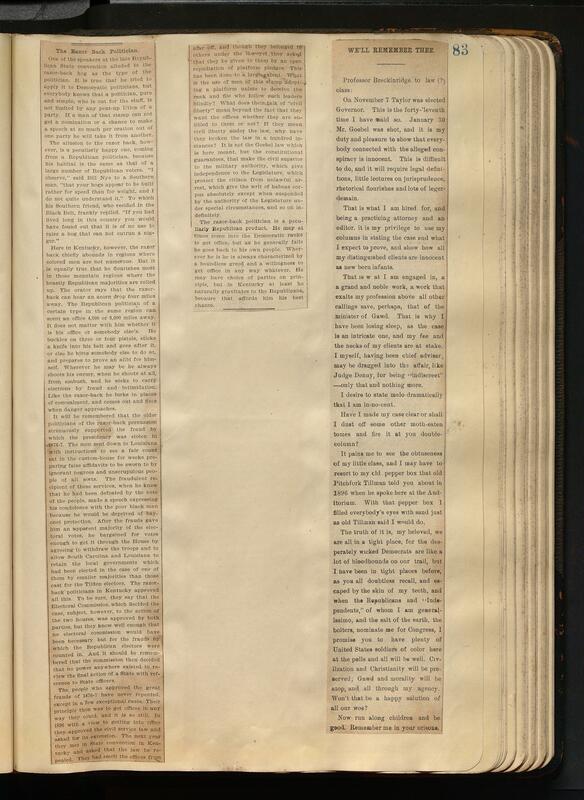 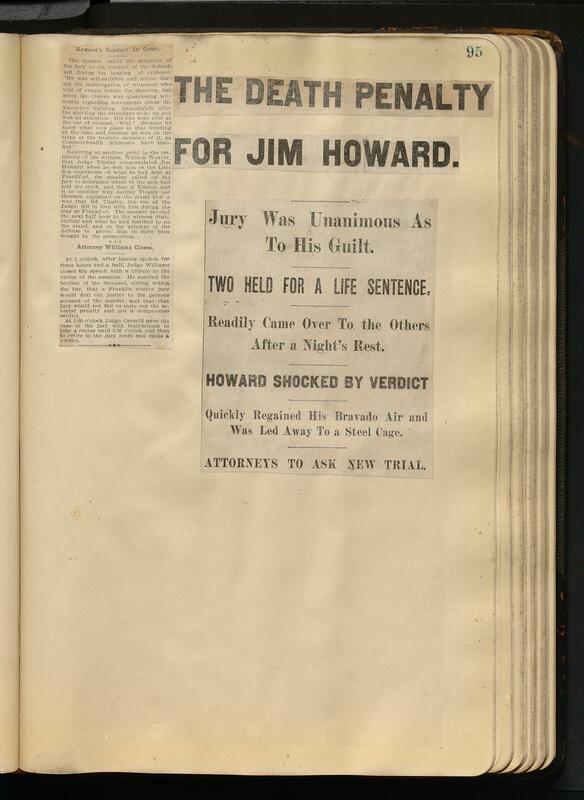 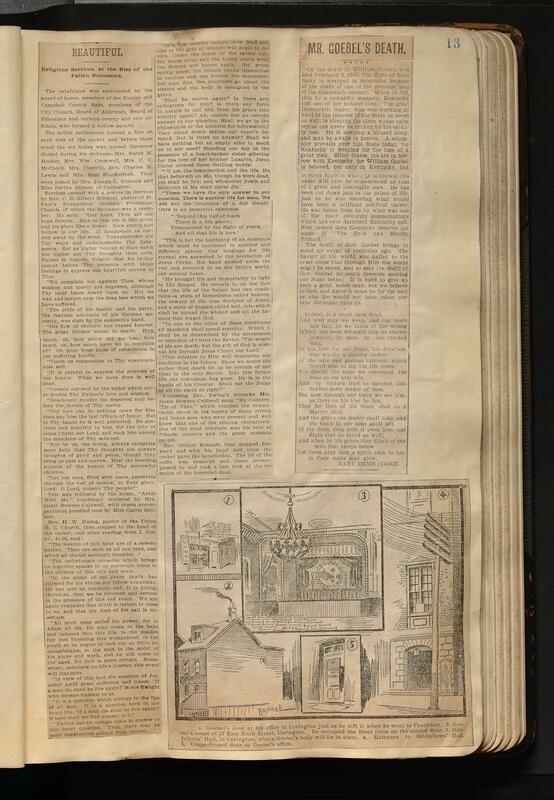 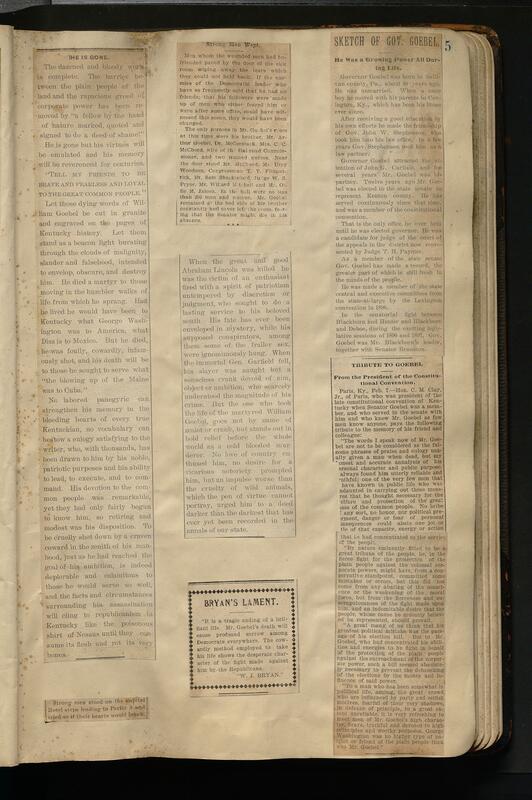 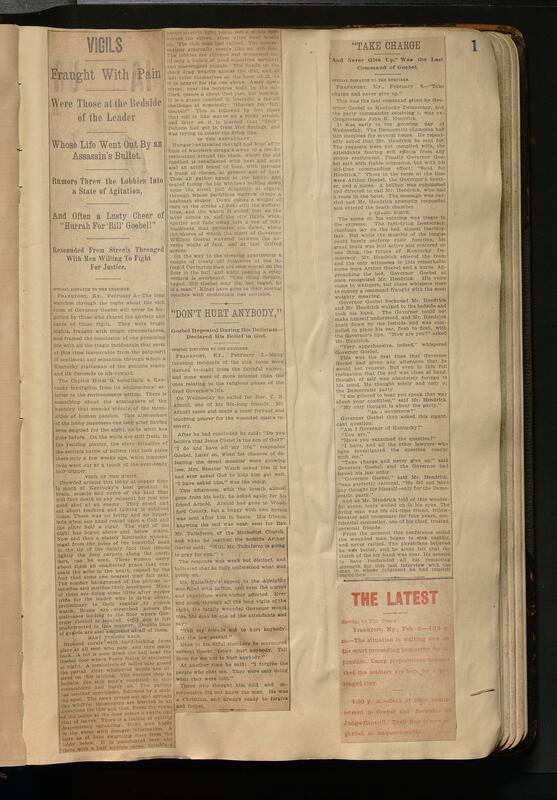 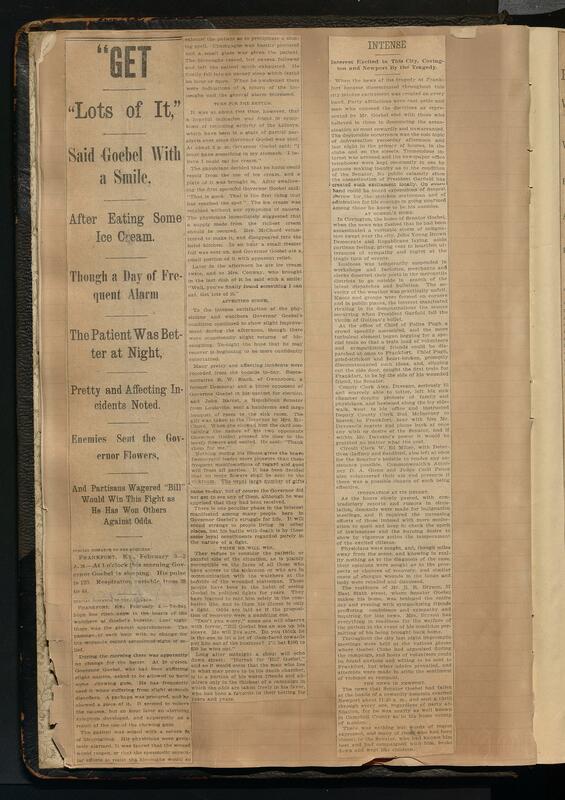 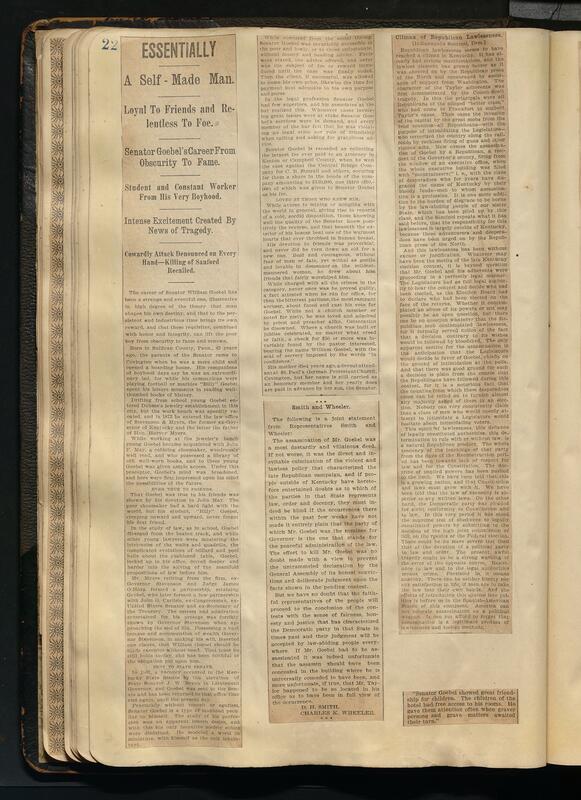 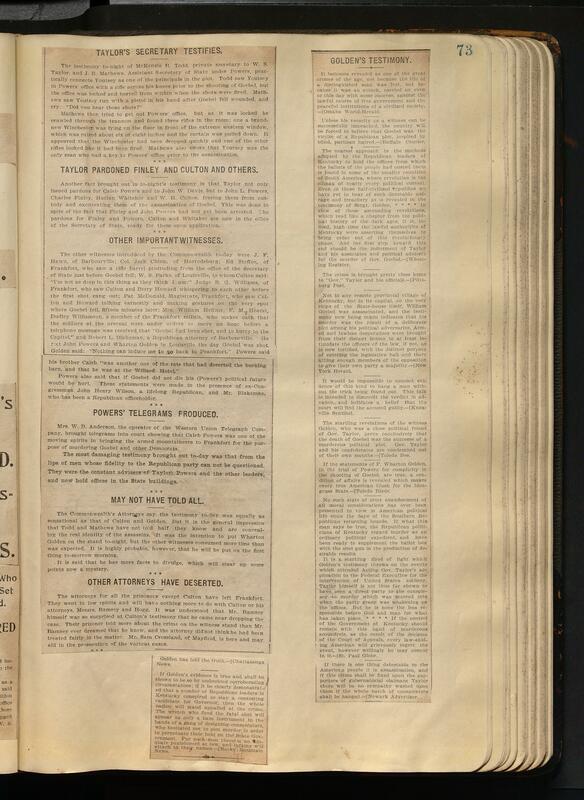 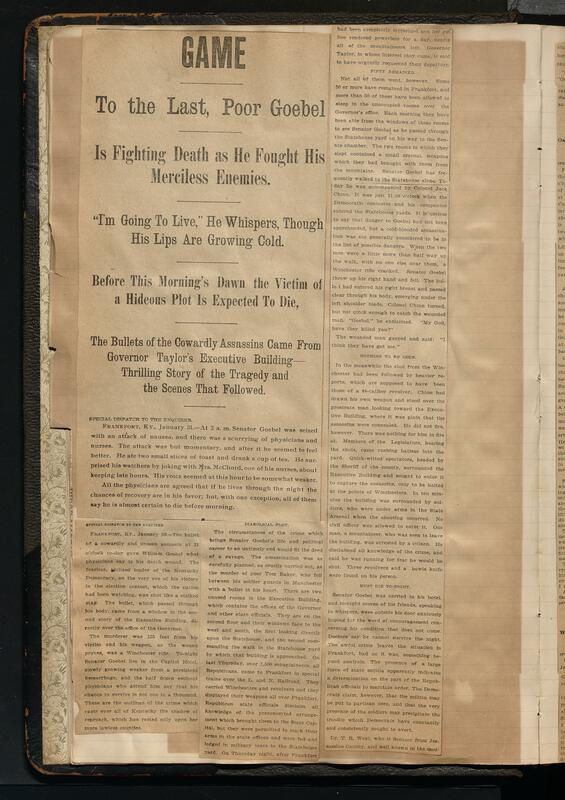 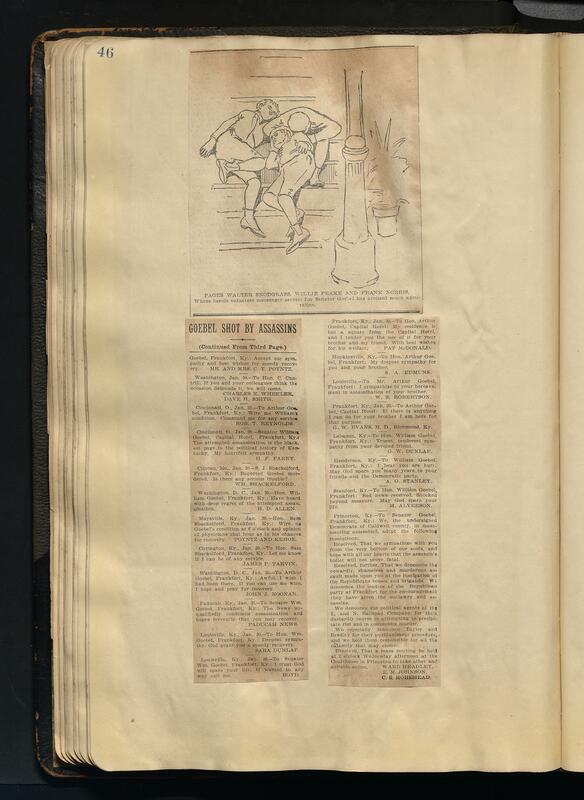 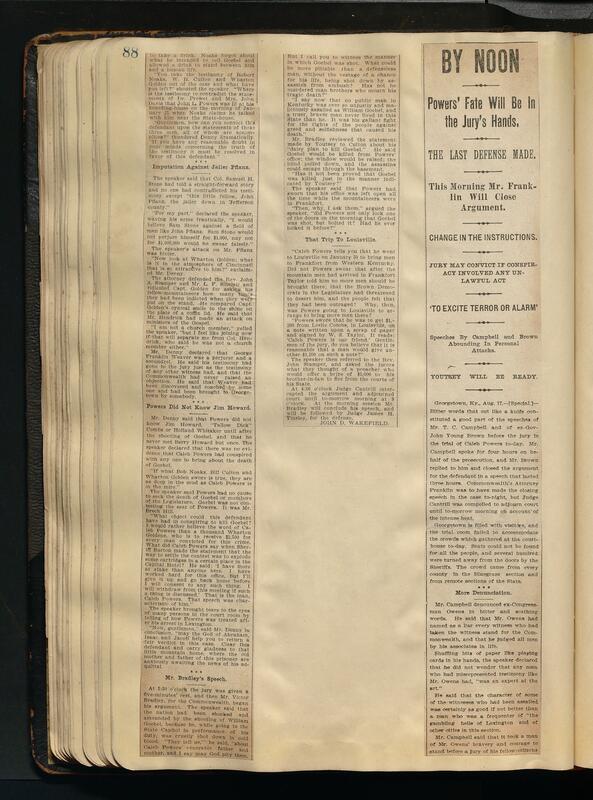 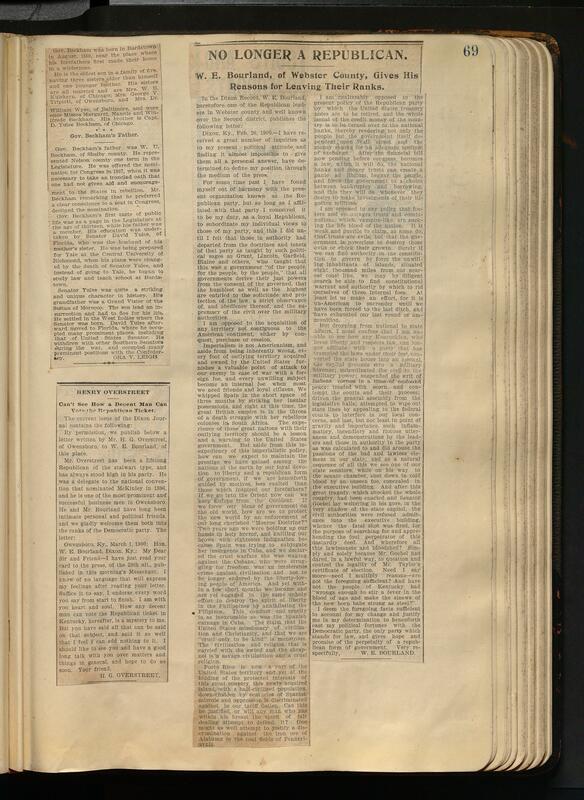 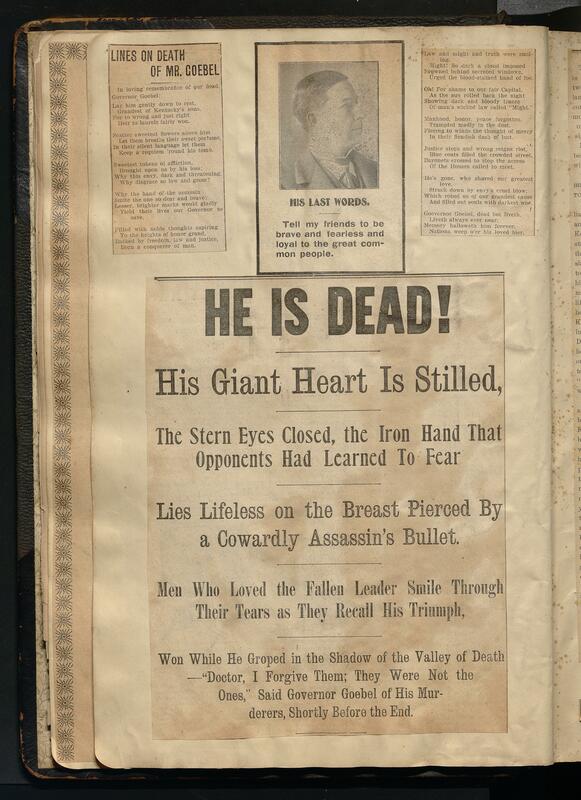 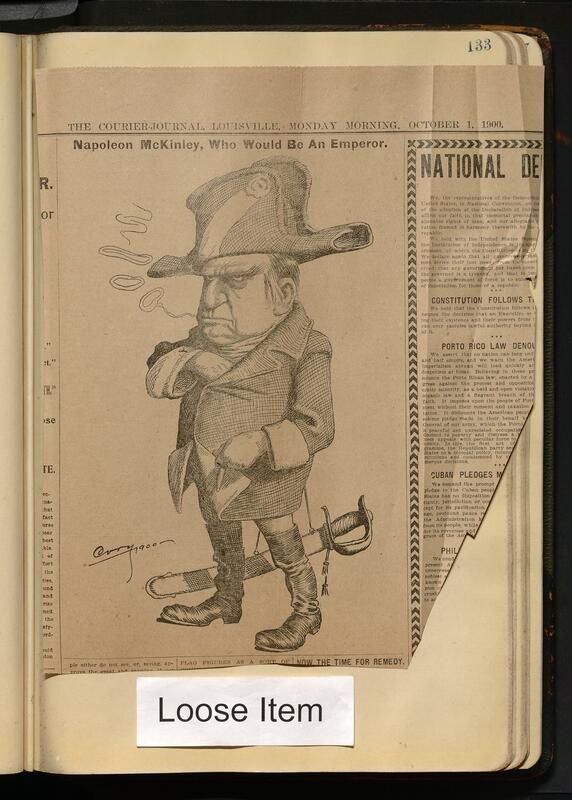 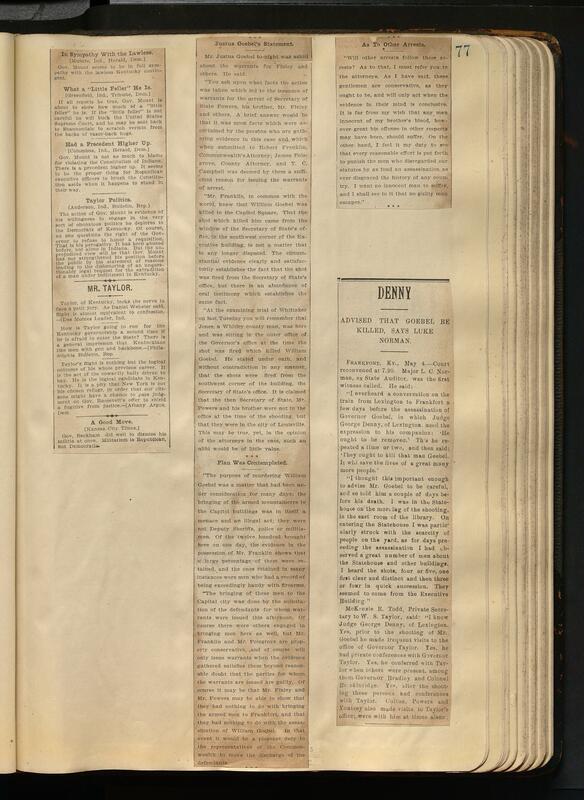 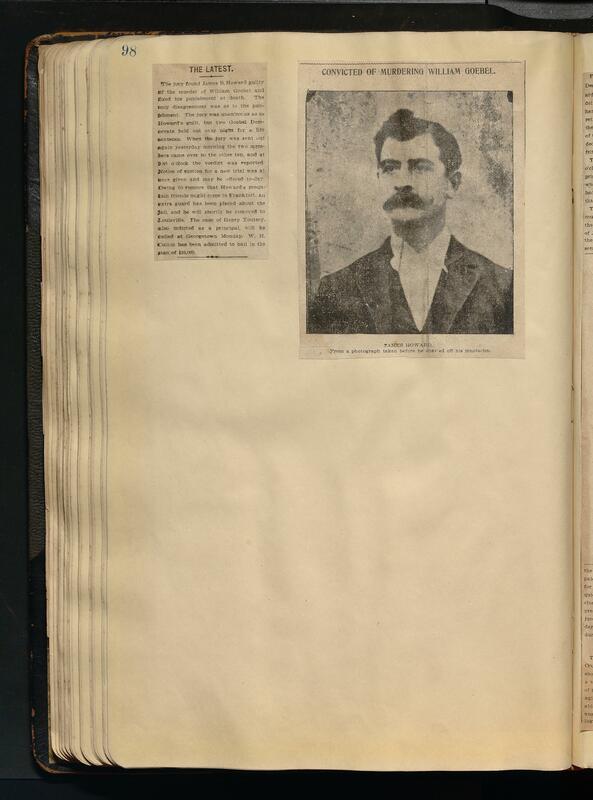 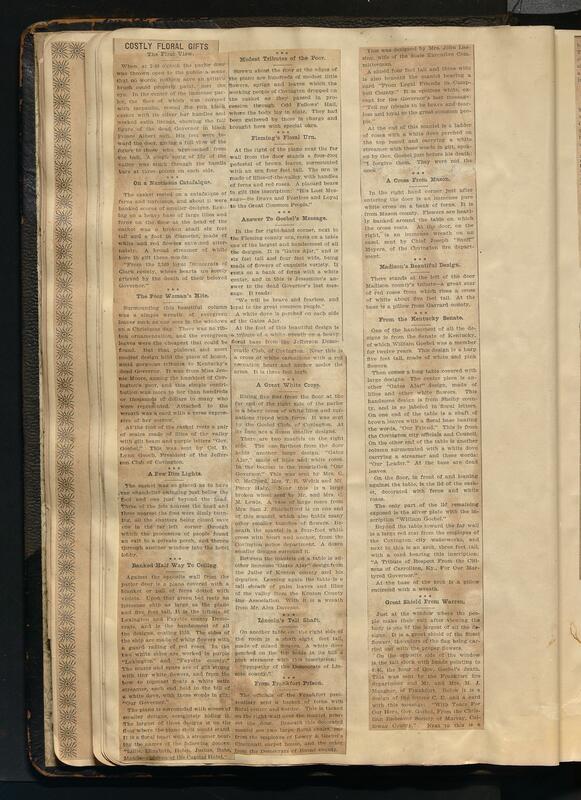 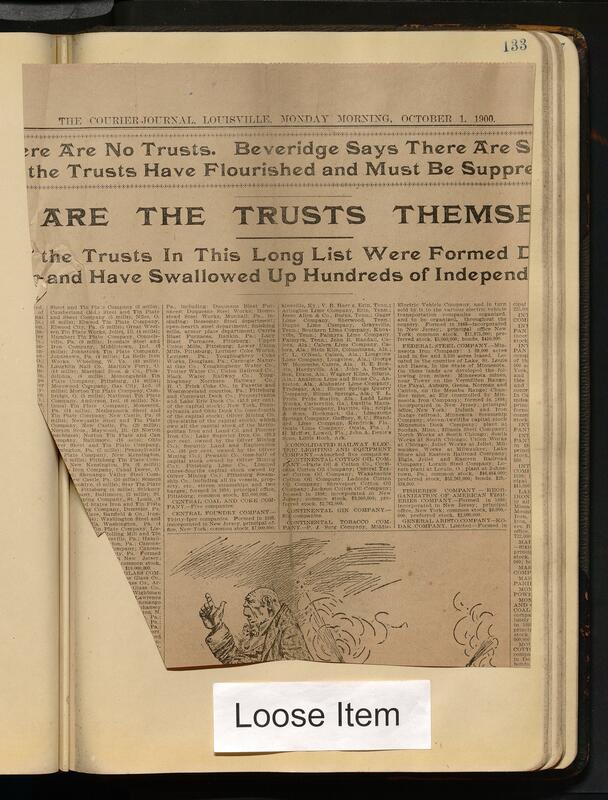 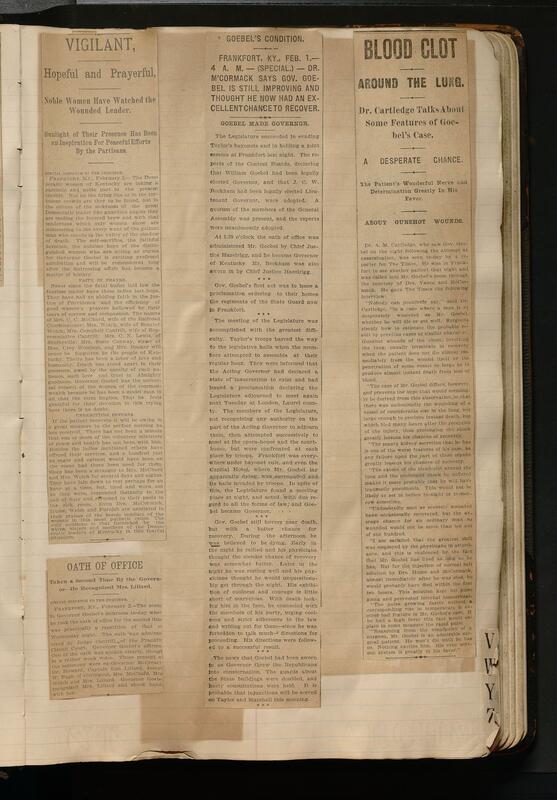 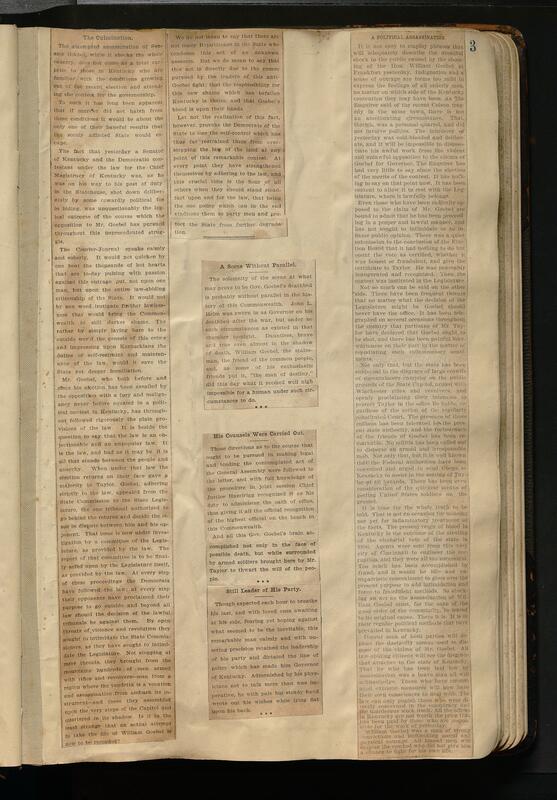 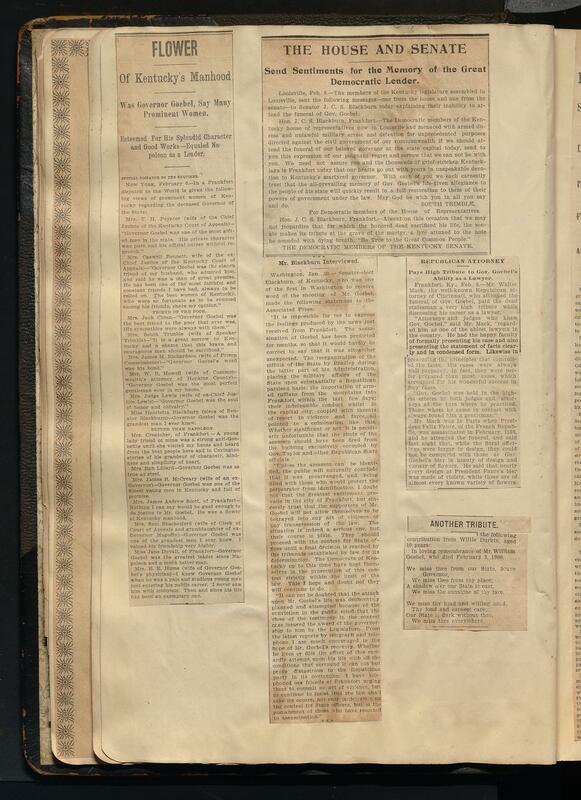 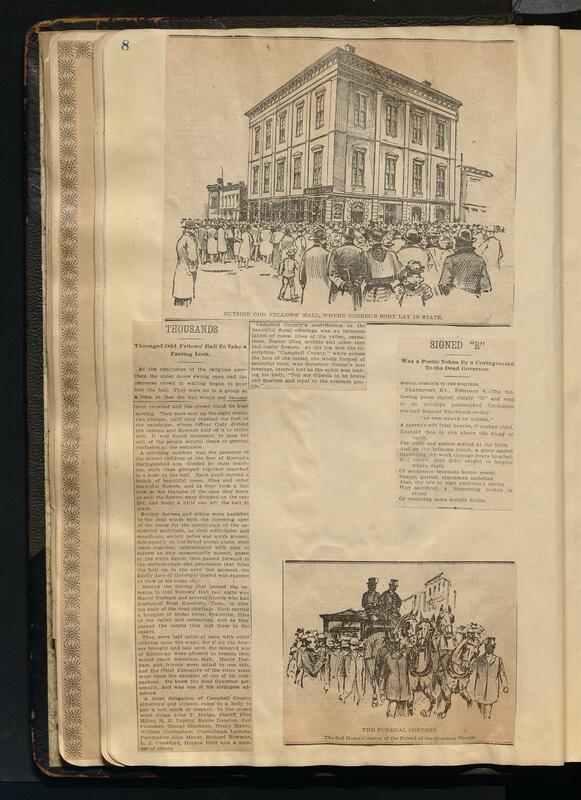 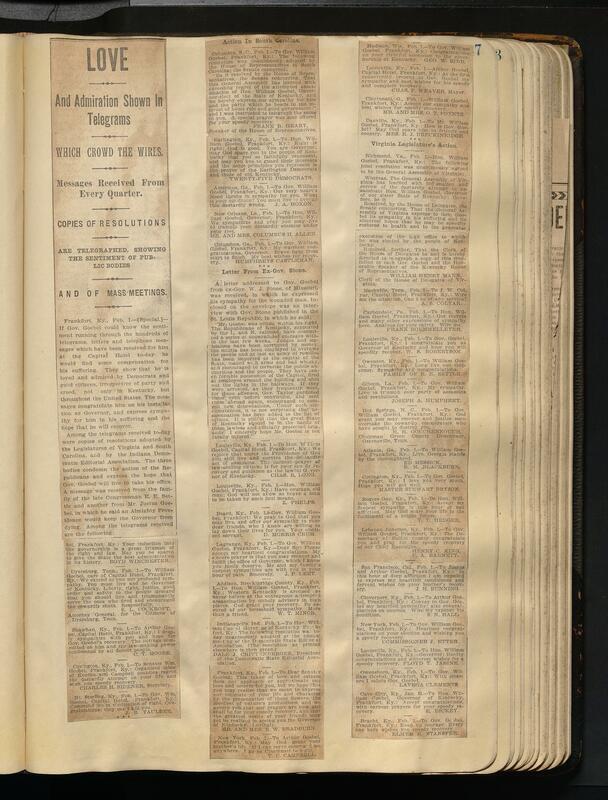 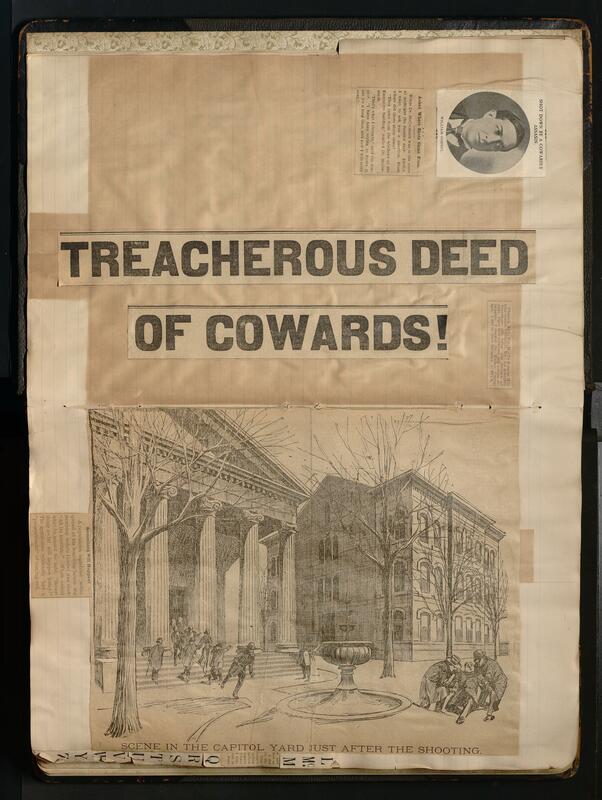 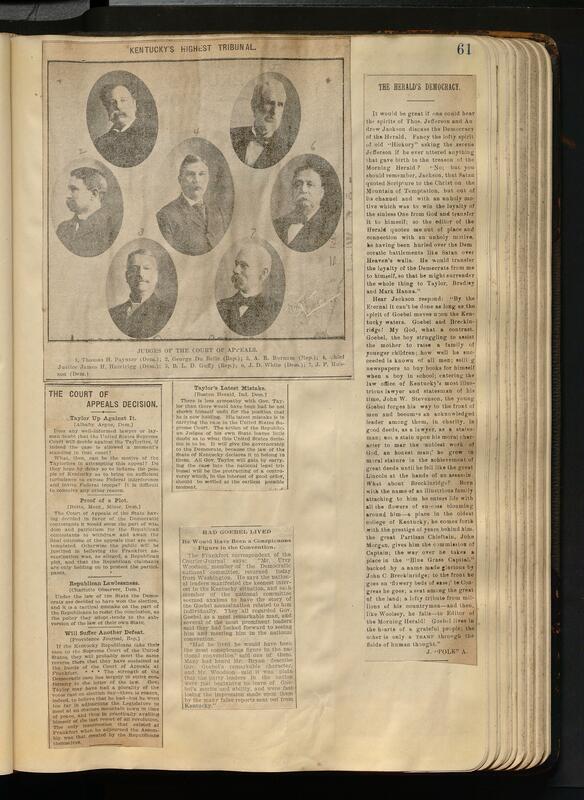 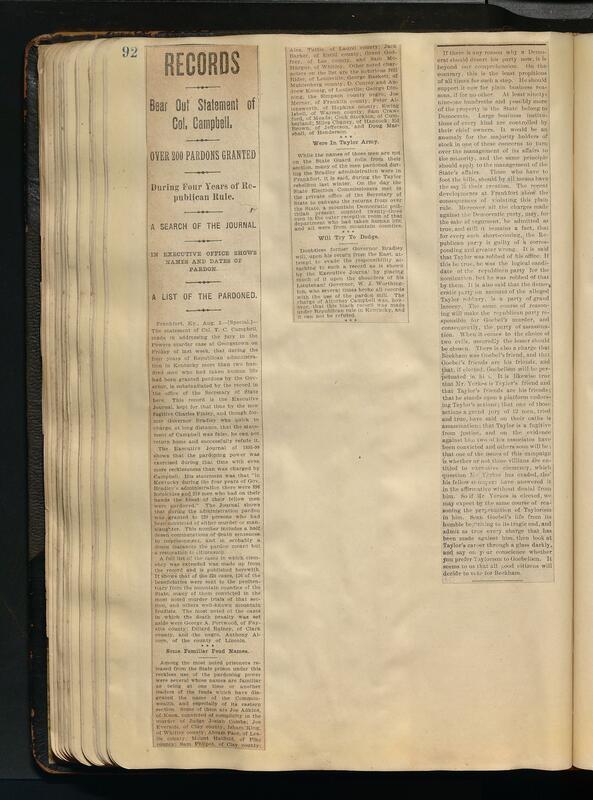 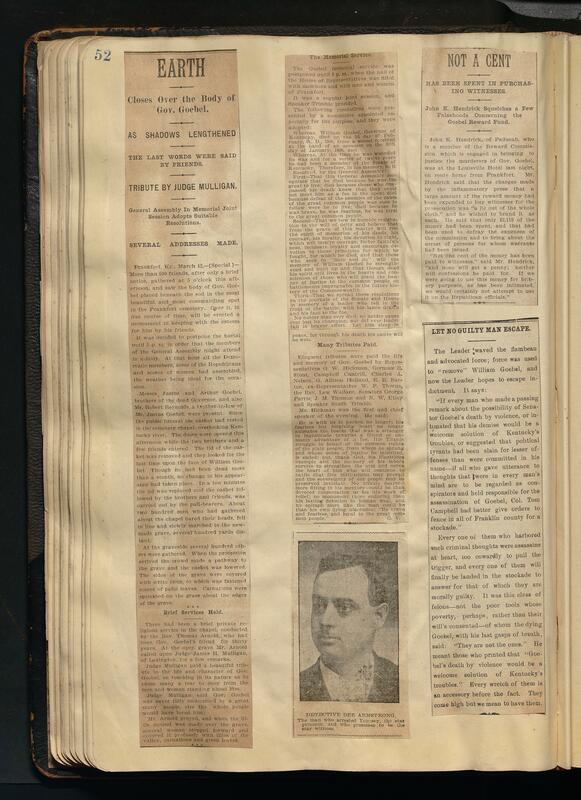 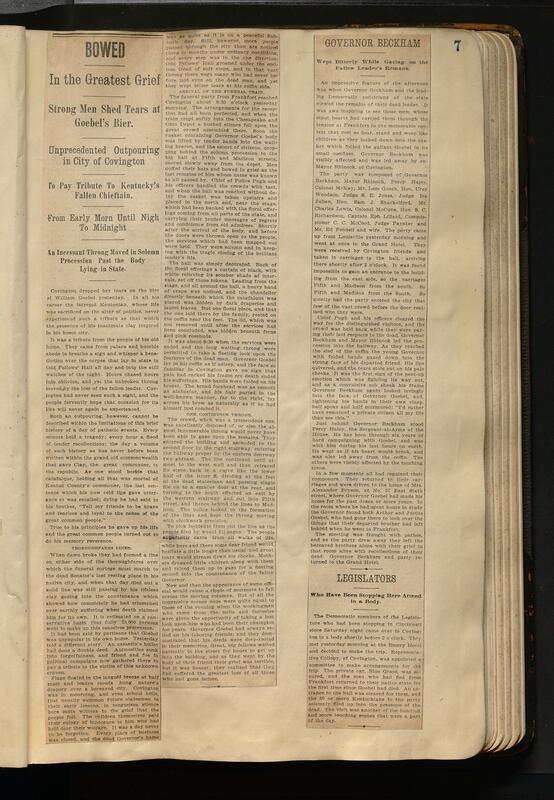 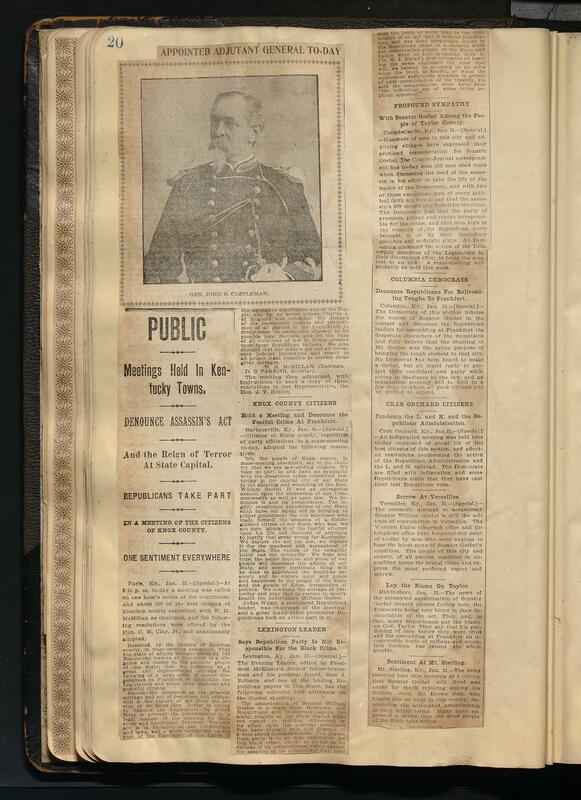 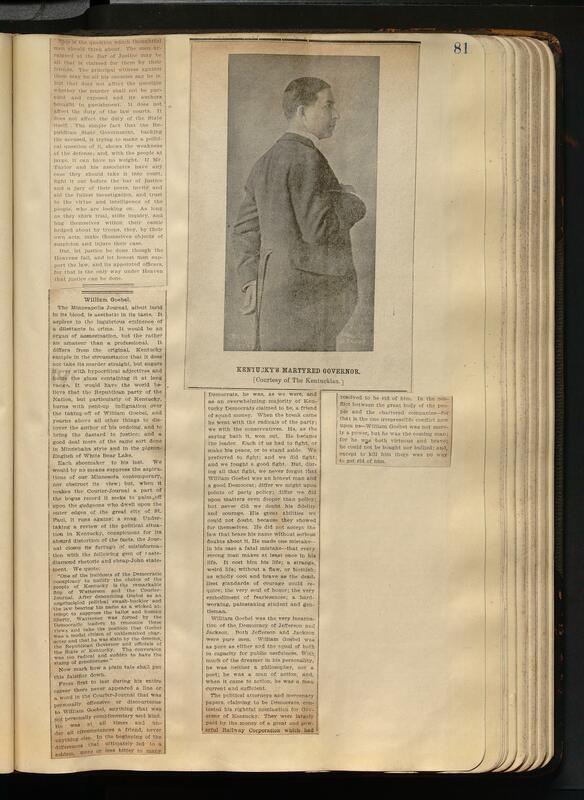 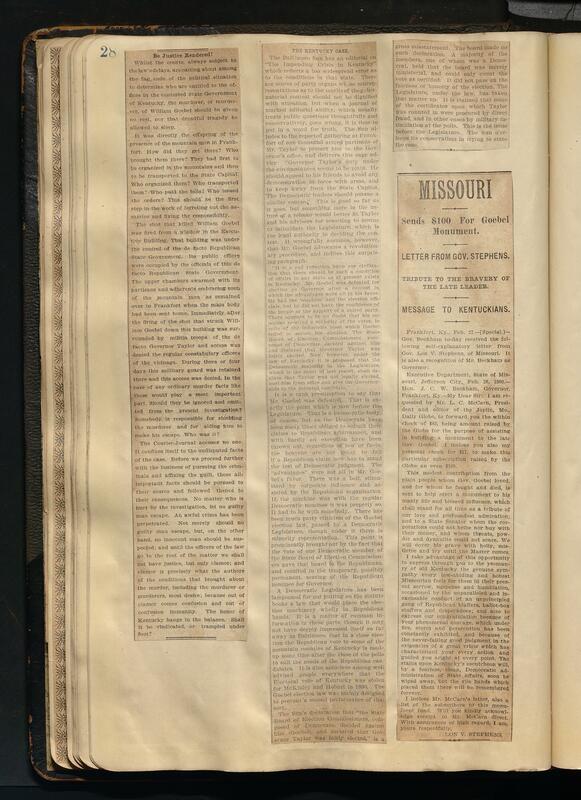 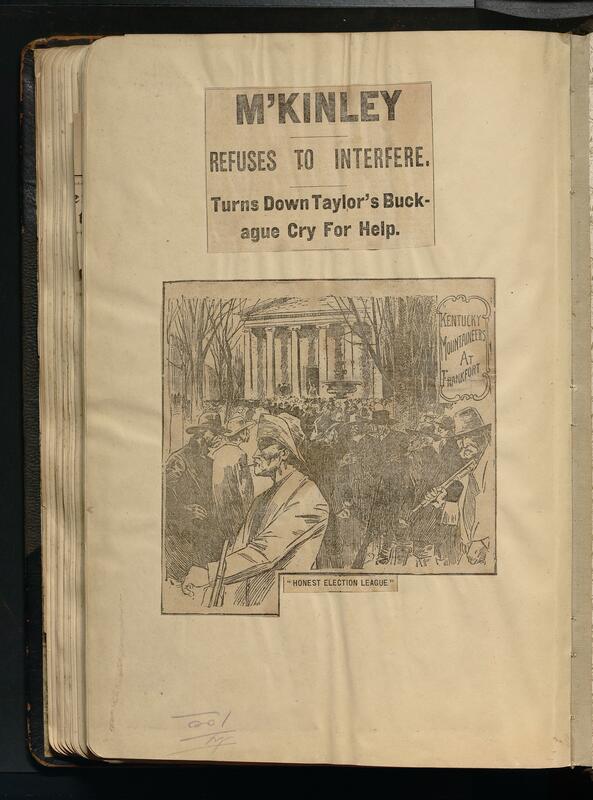 The scrapbook includes newspaper clippings documenting the assassination of Kentucky Governor William Goebel in 1900and subsequent events surrounding the assassination. 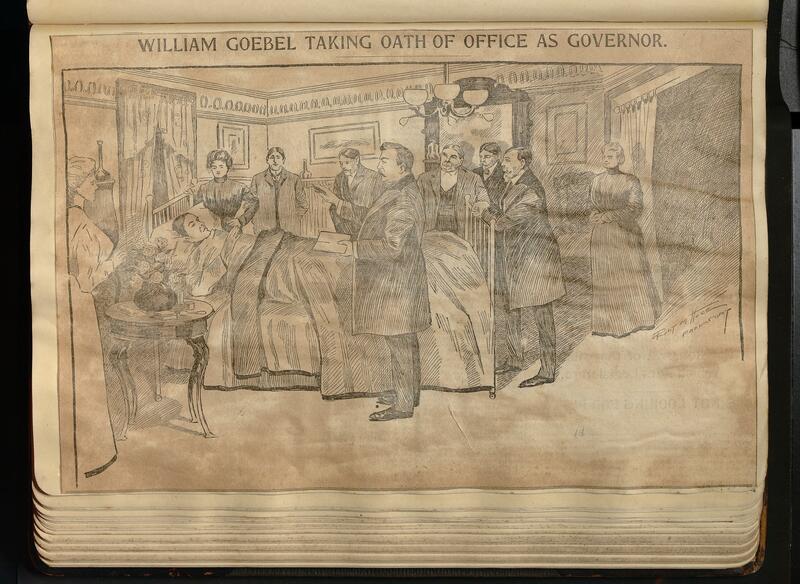 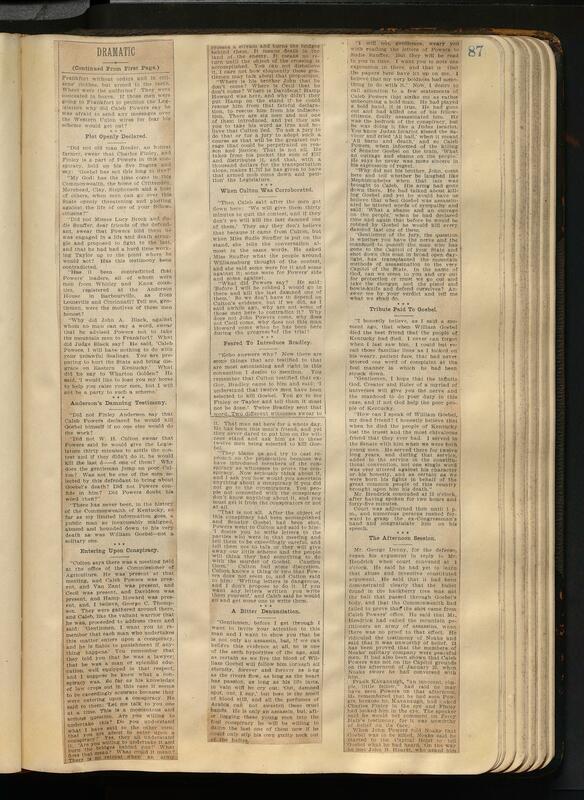 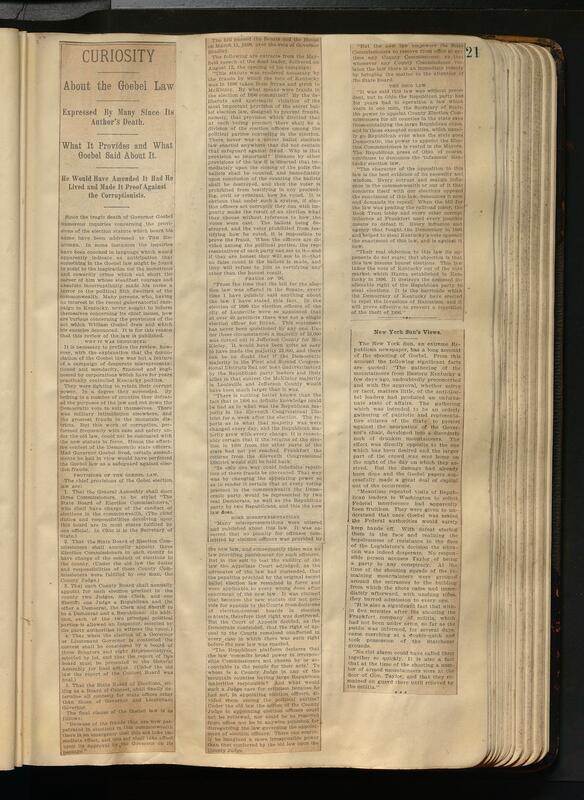 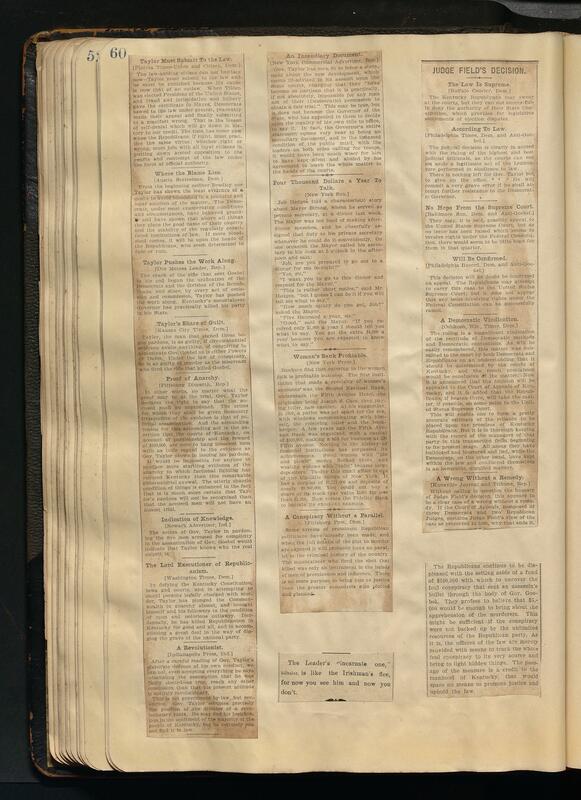 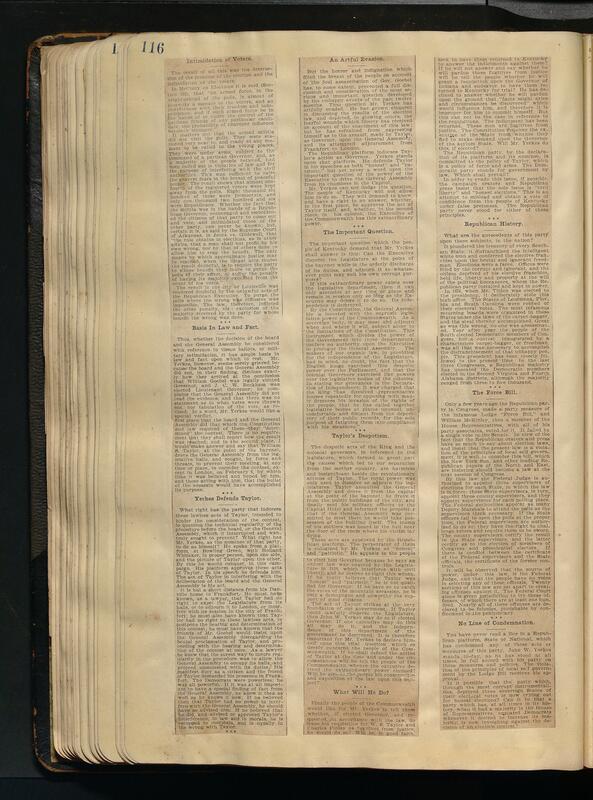 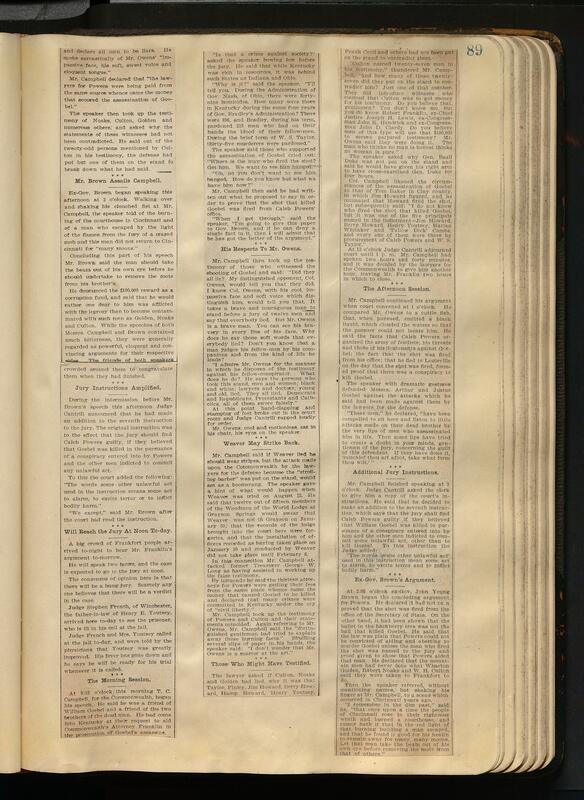 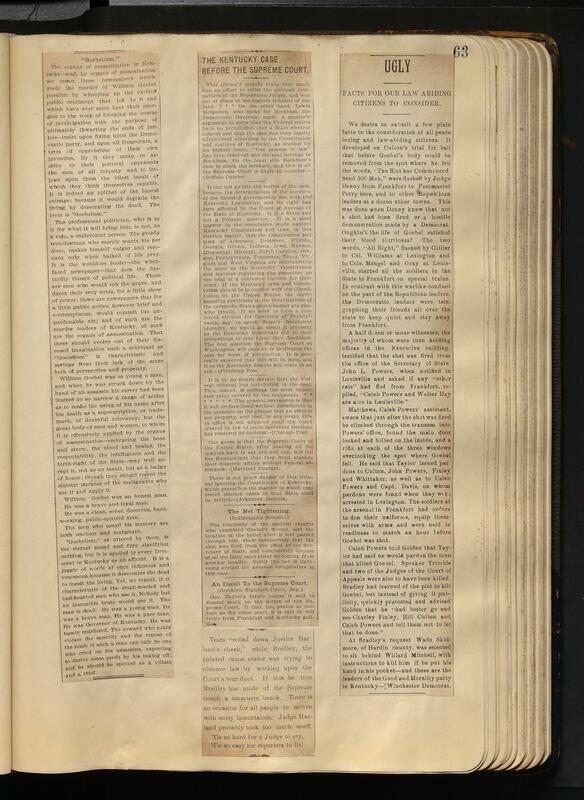 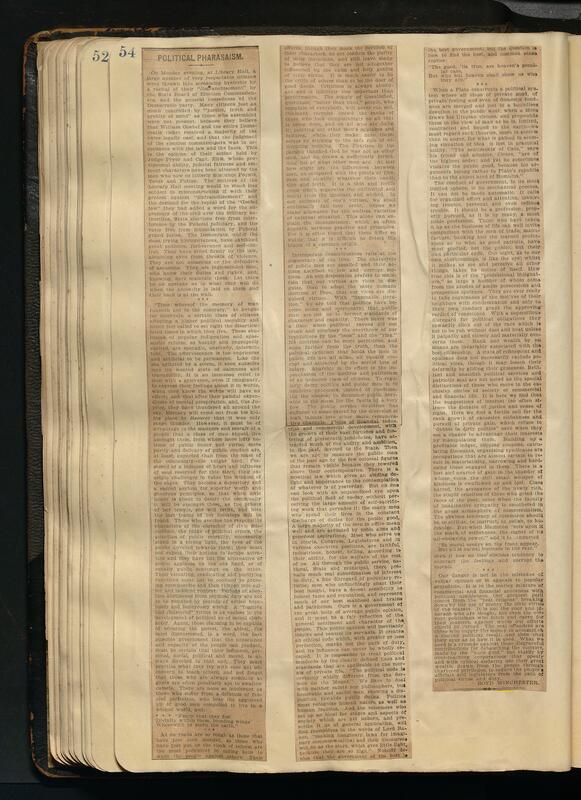 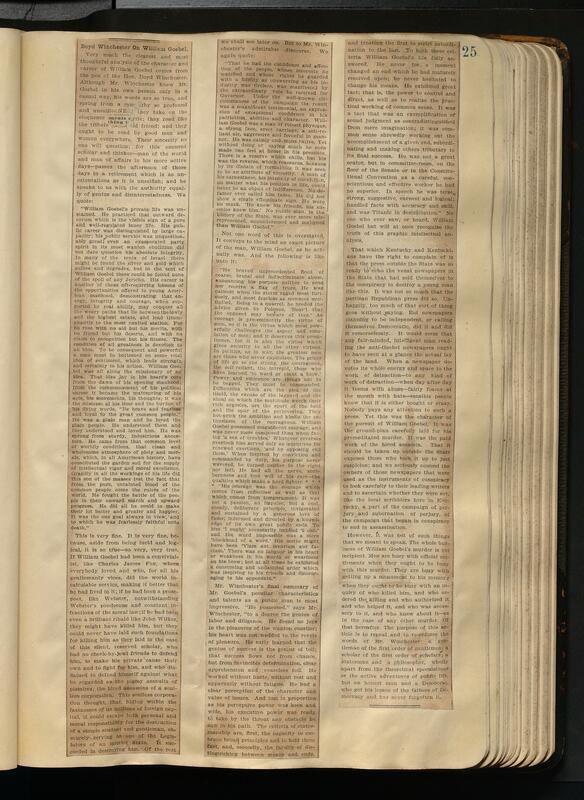 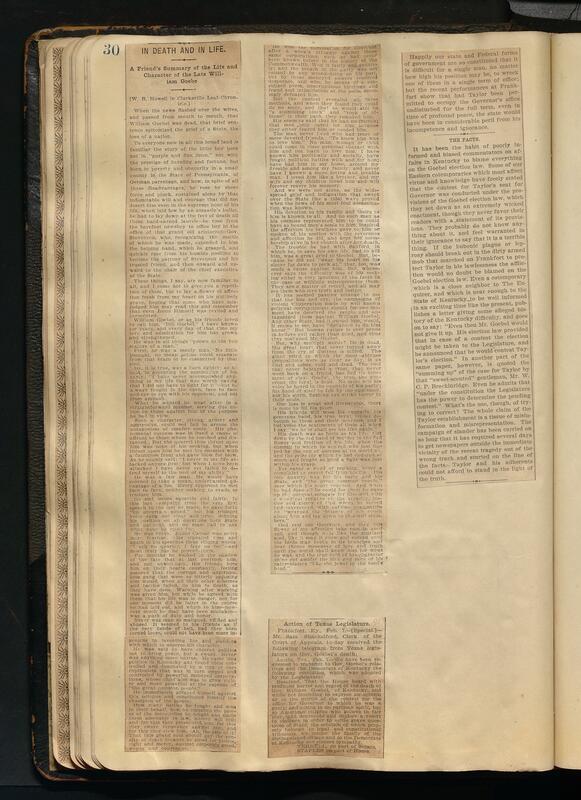 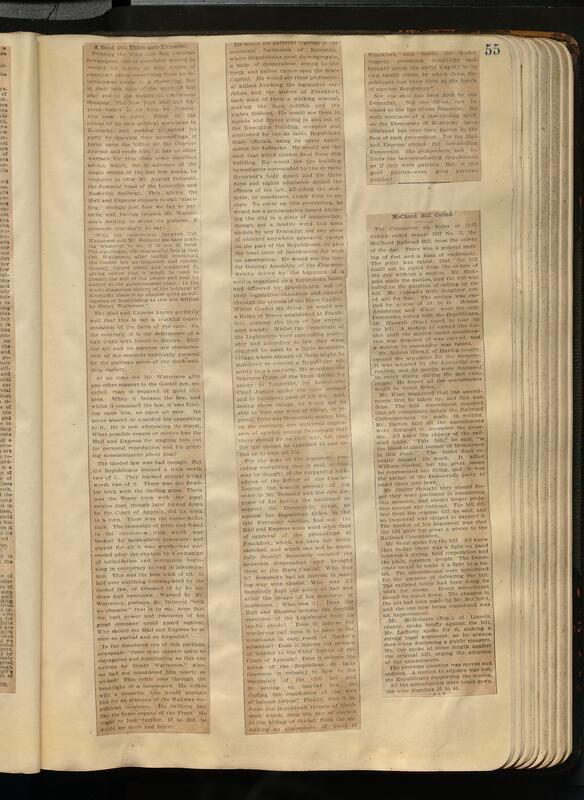 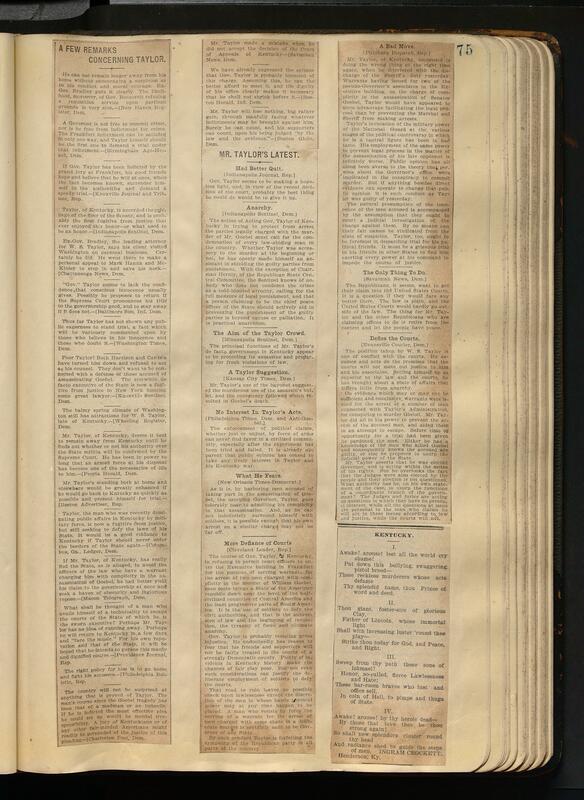 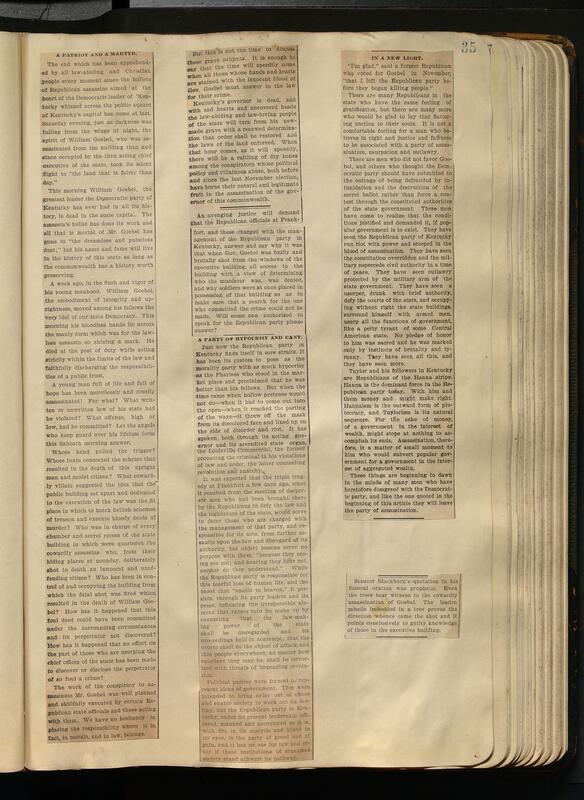 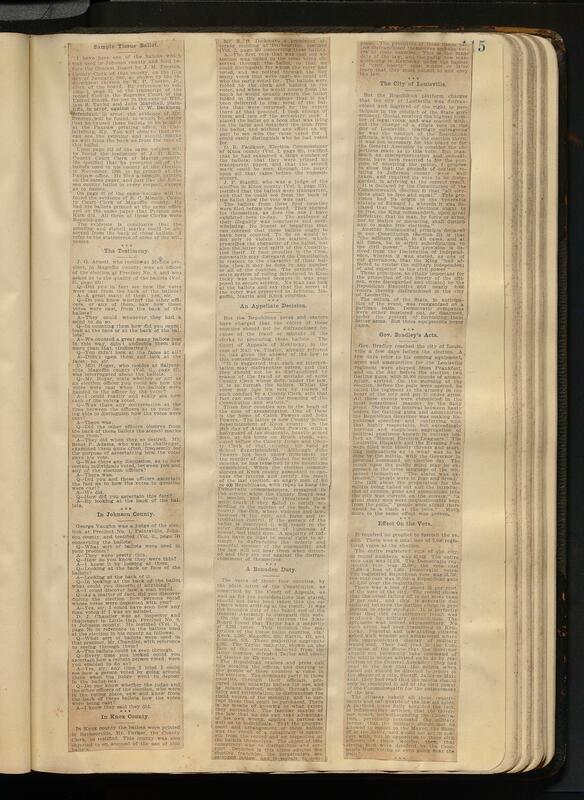 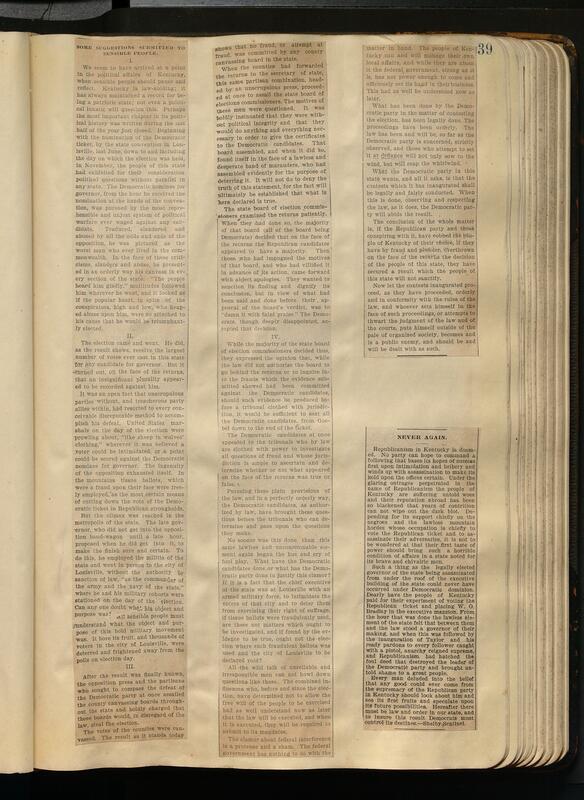 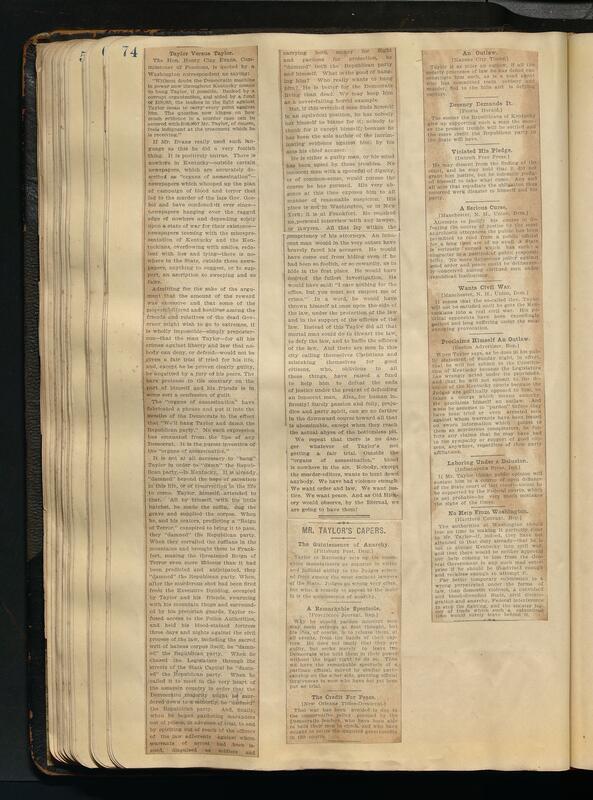 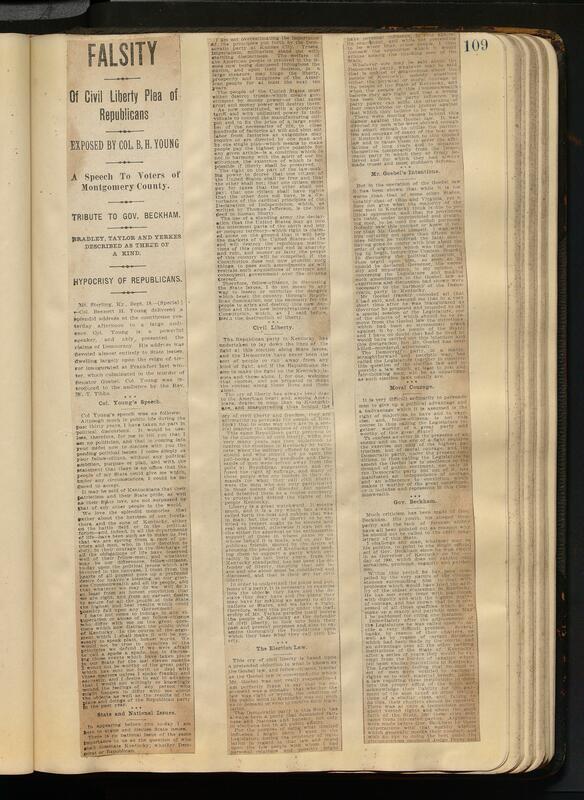 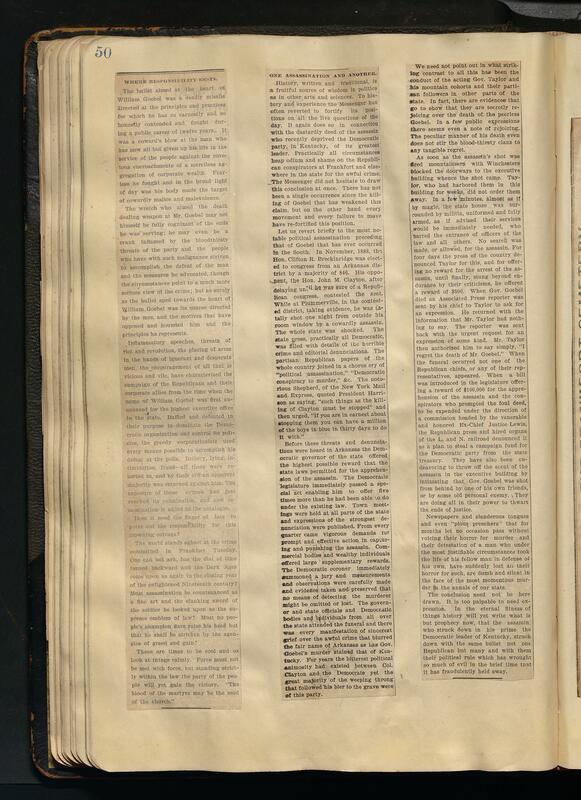 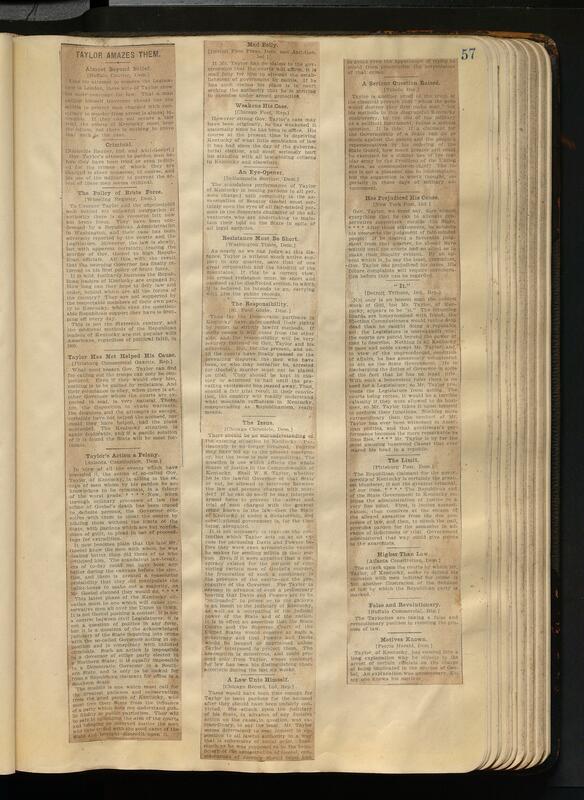 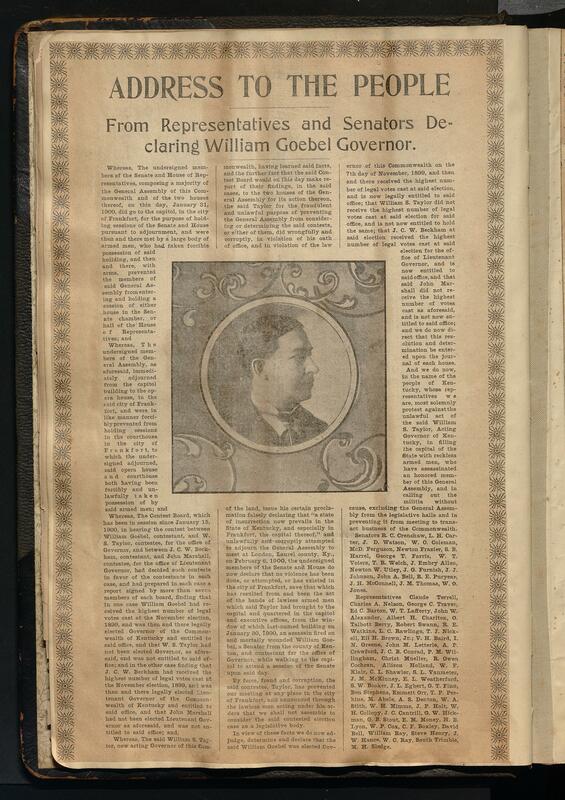 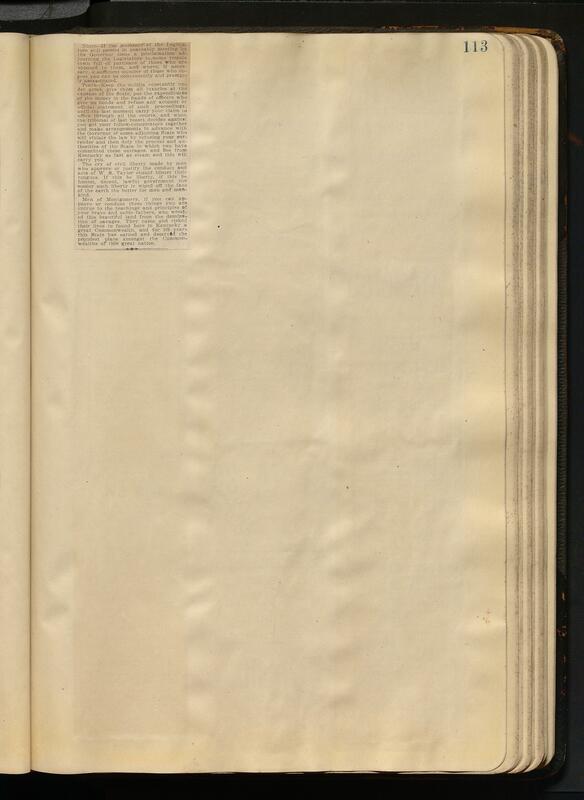 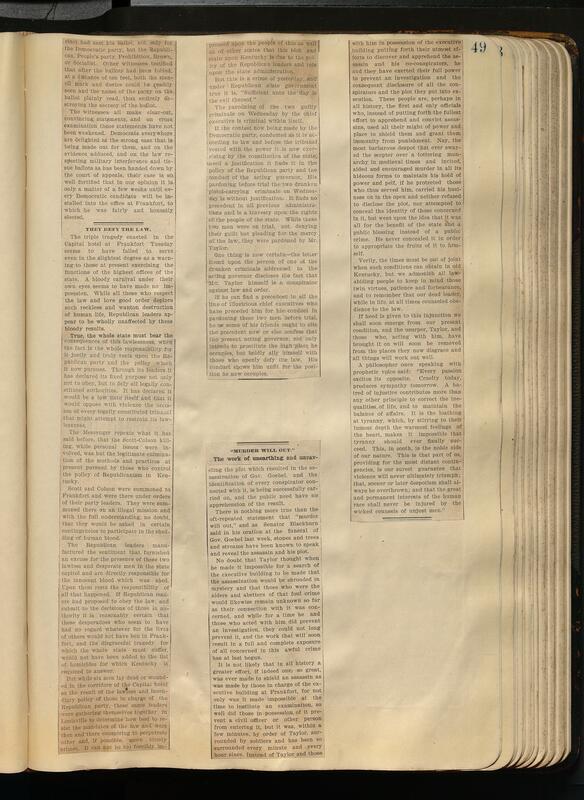 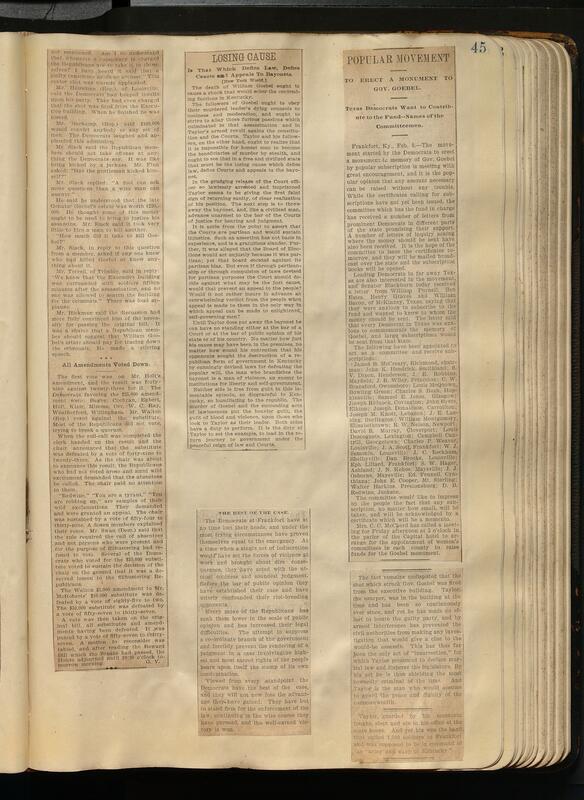 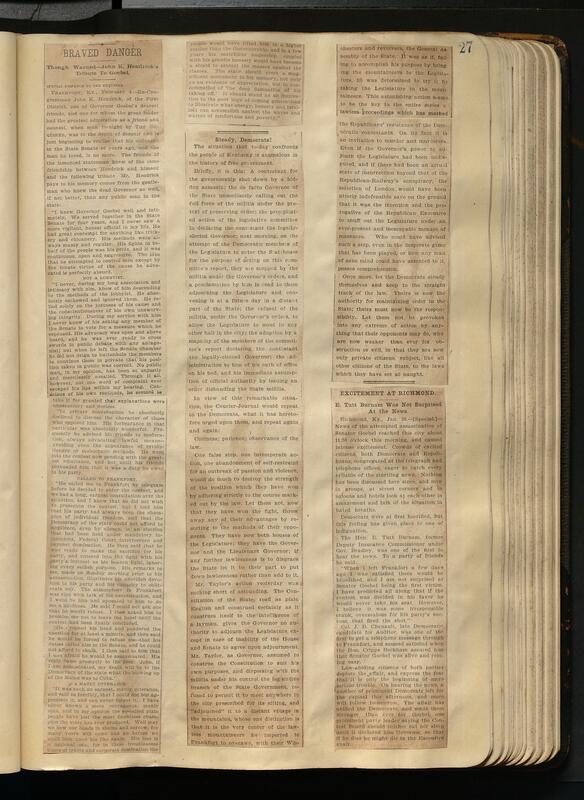 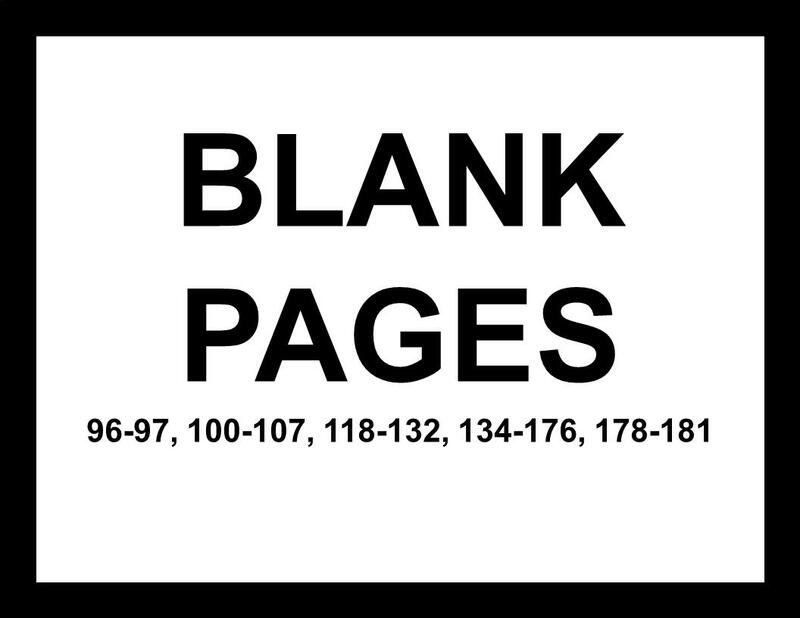 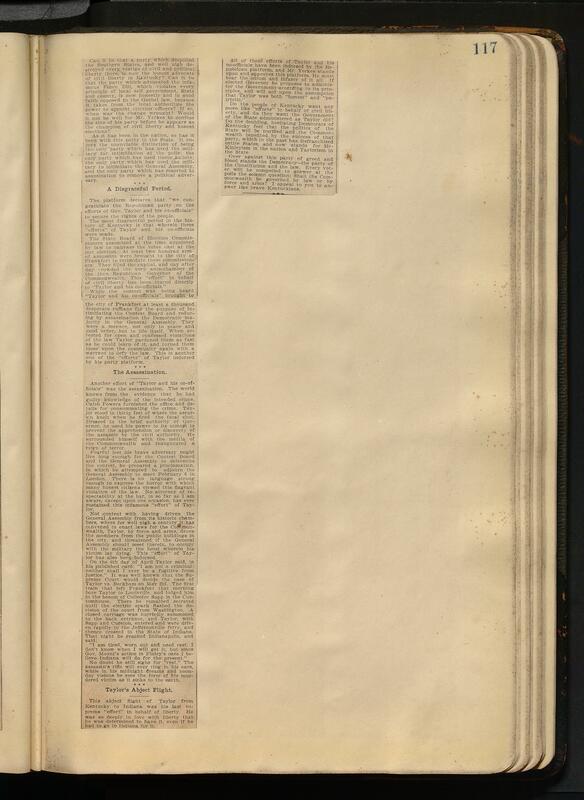 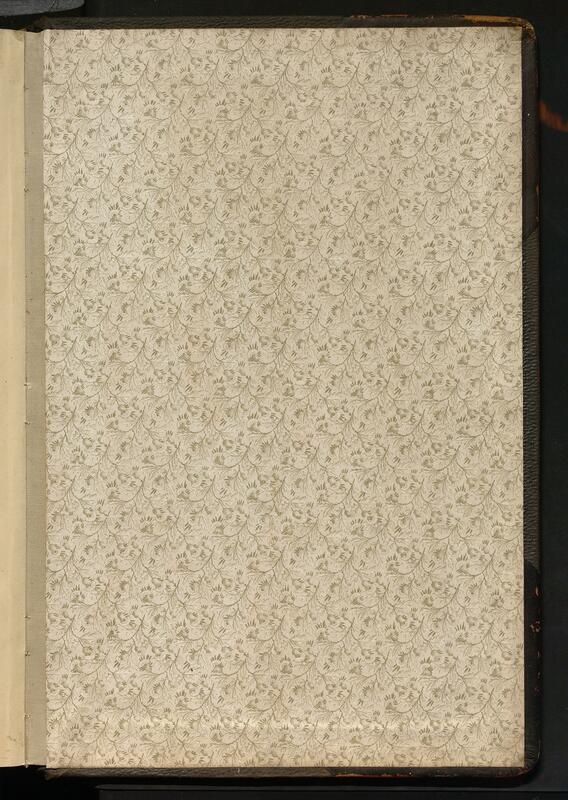 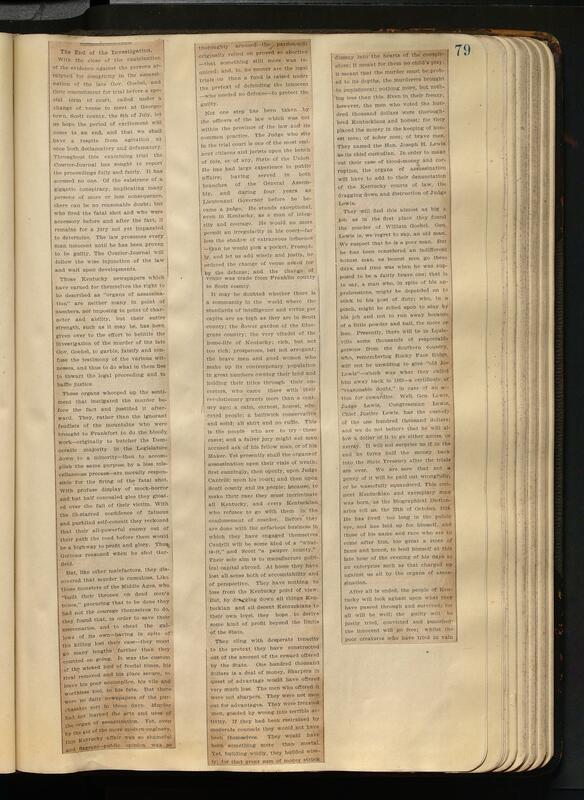 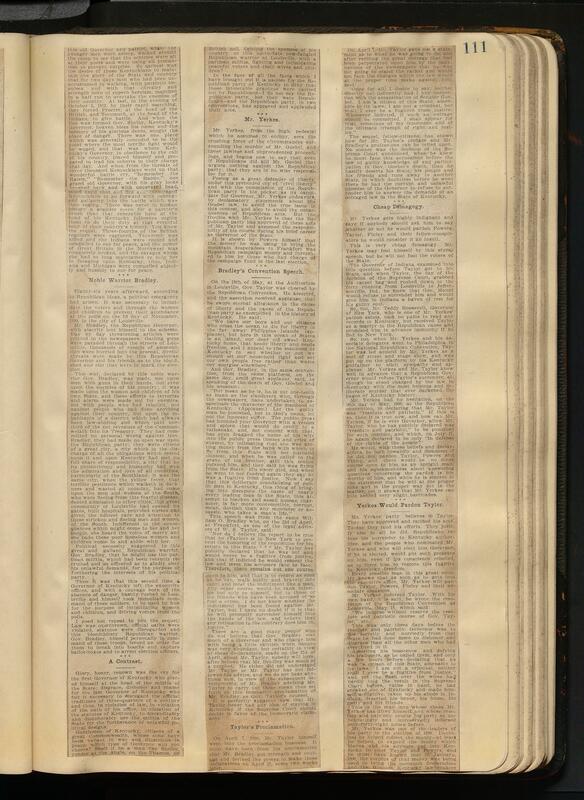 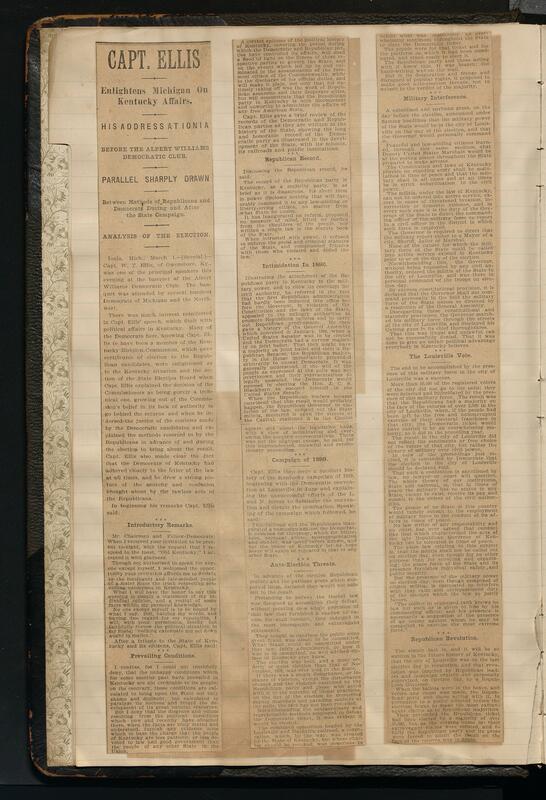 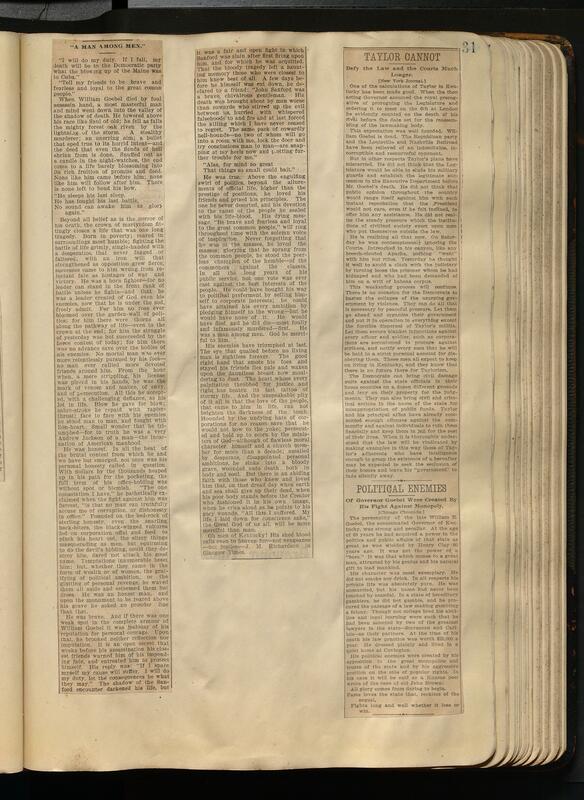 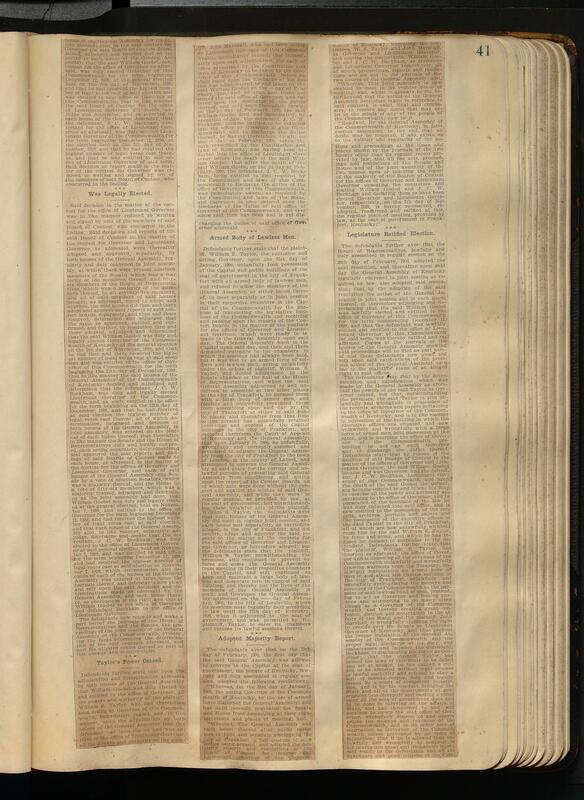 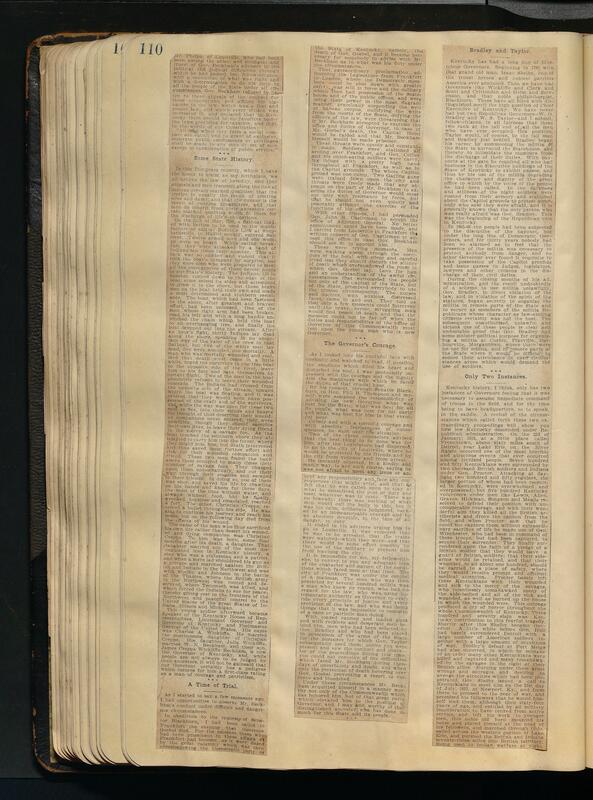 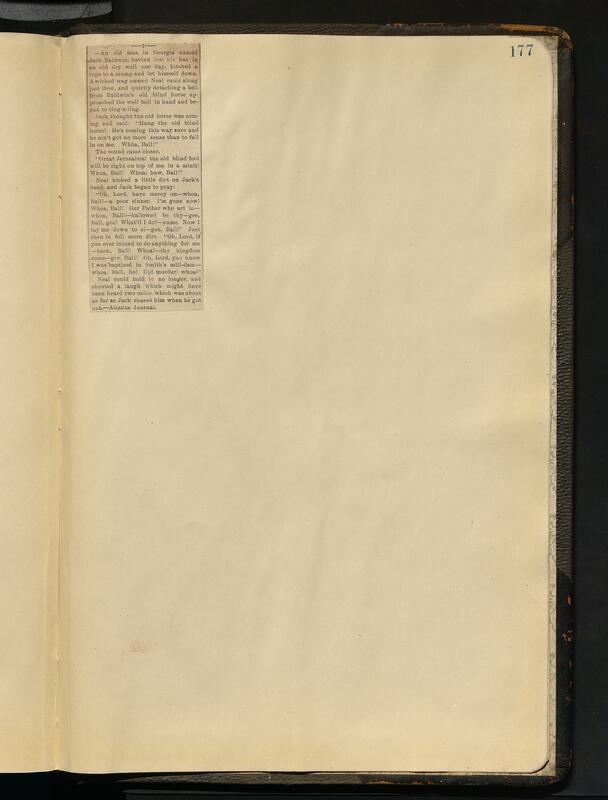 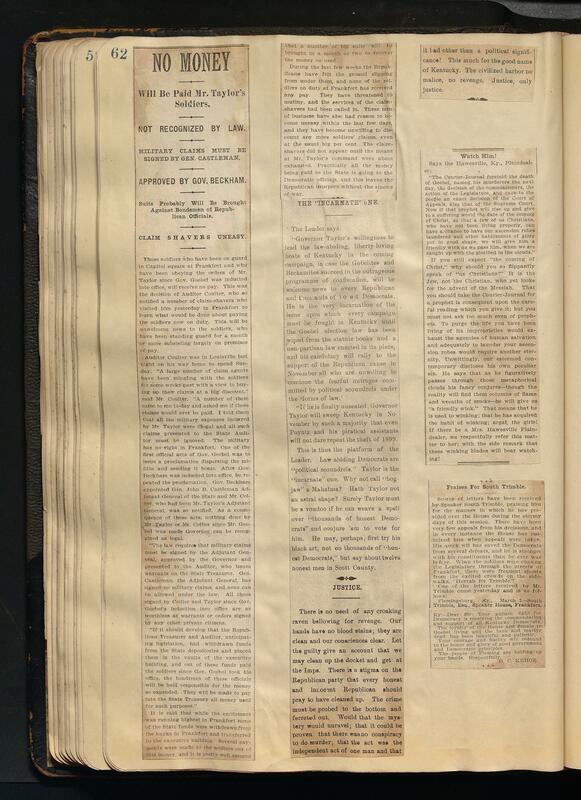 Additionally, the scrapbook includes information pertaining to William Goebel's political life. 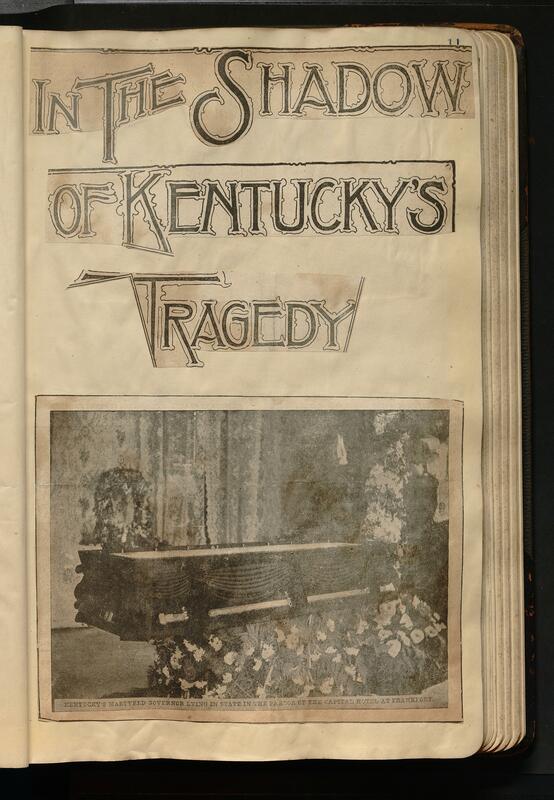 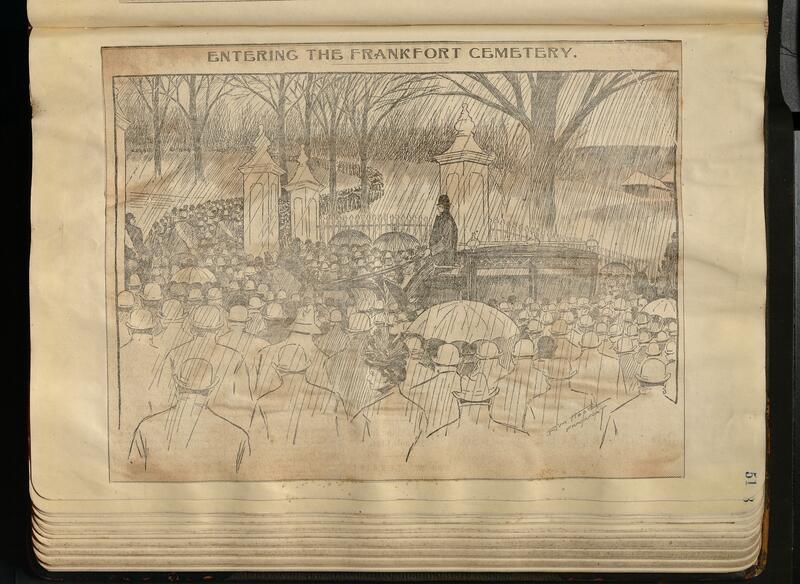 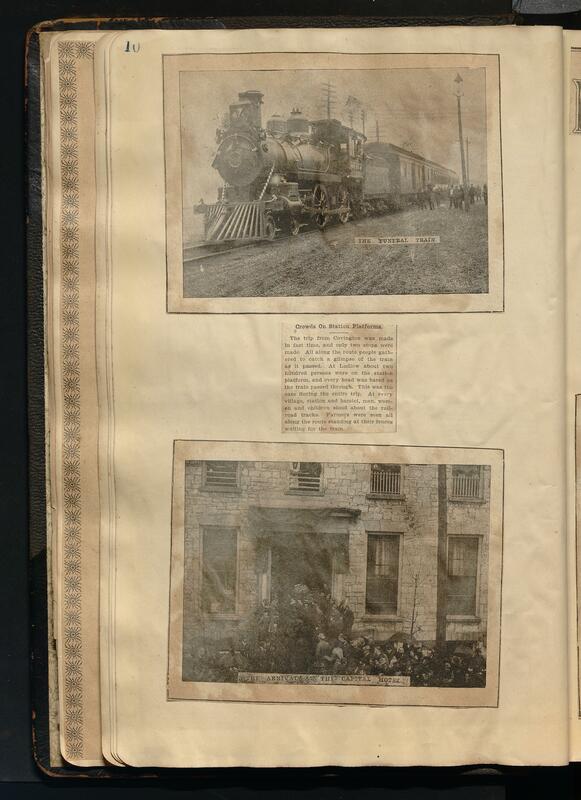 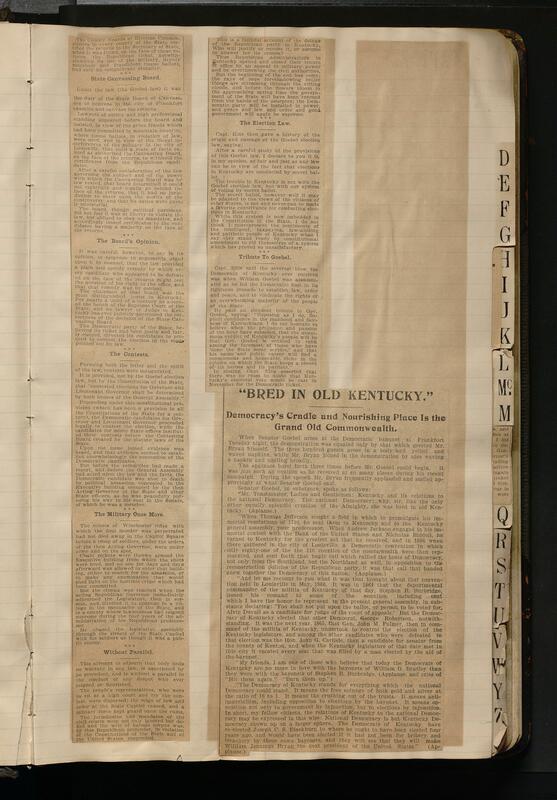 Robert G. Wallis created the scrapbook in Clark County, Kentucky, and dated it 1911.